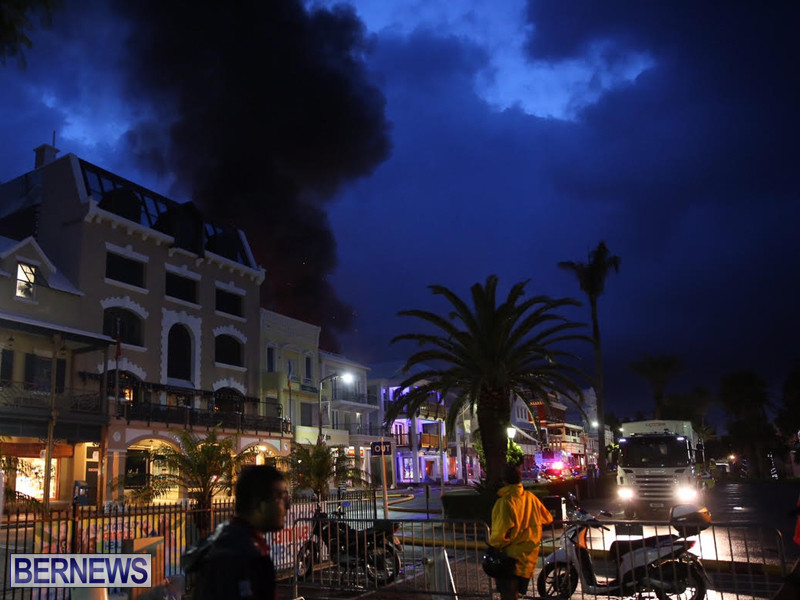 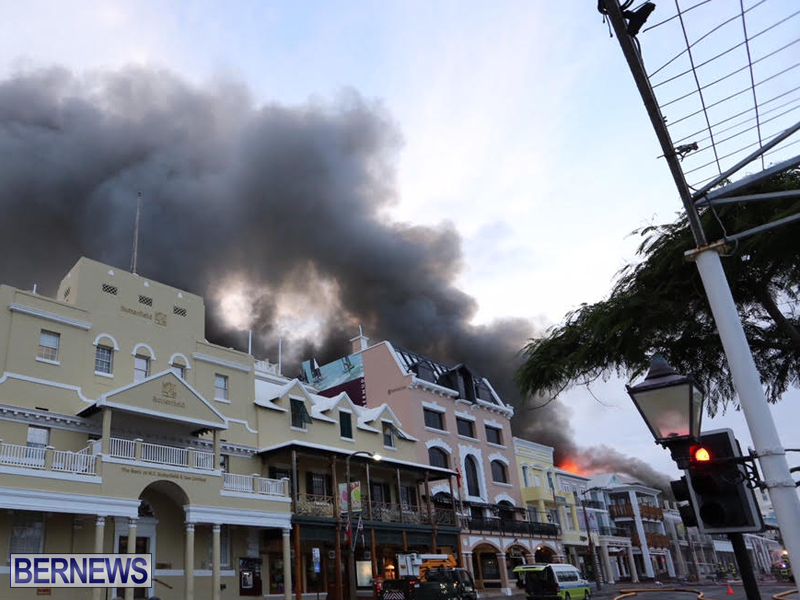 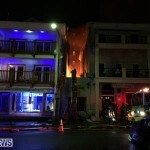 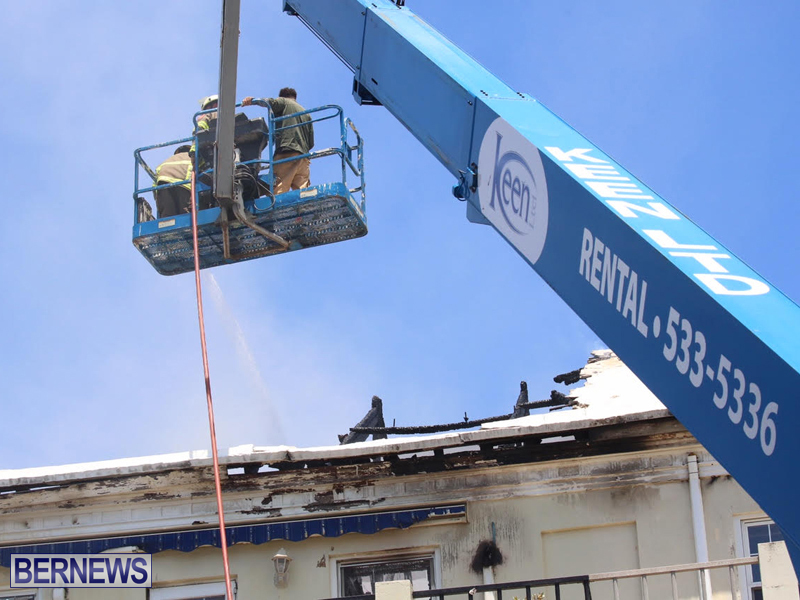 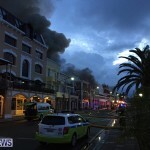 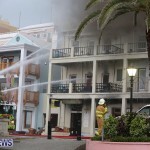 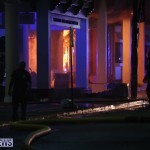 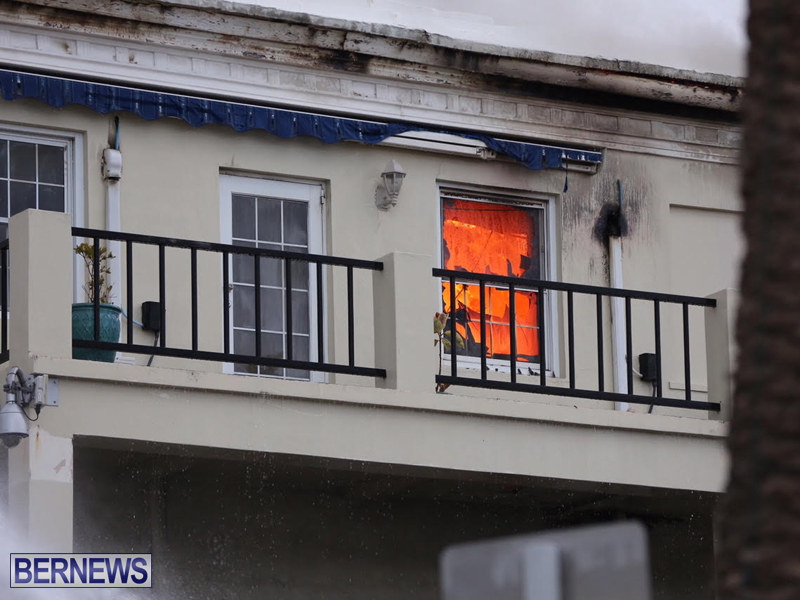 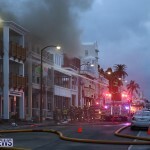 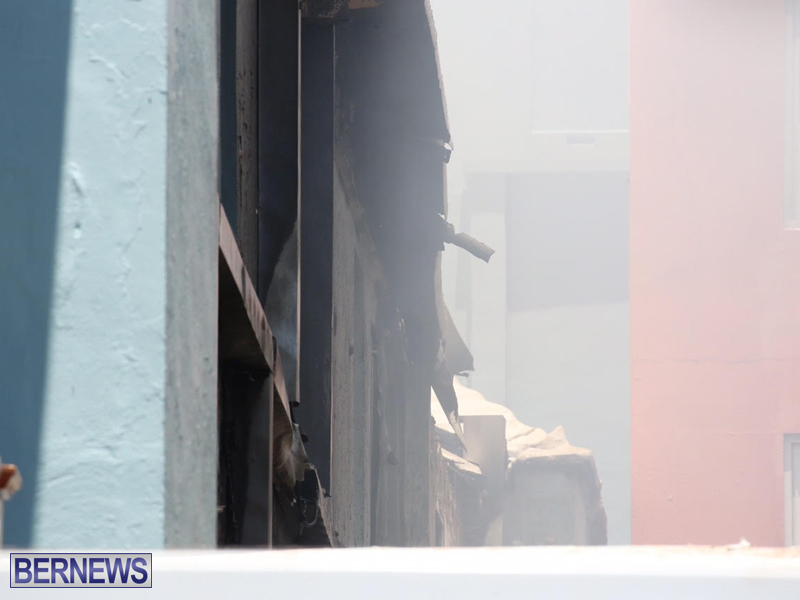 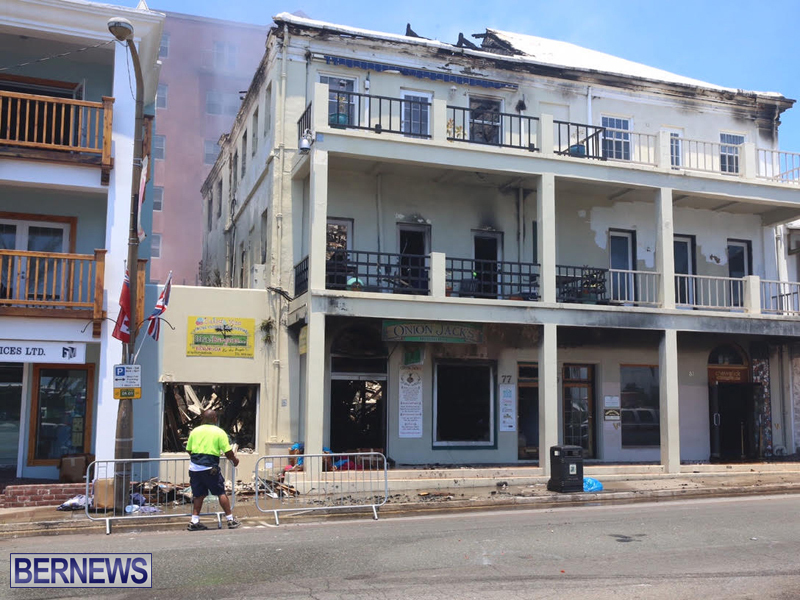 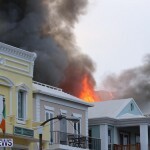 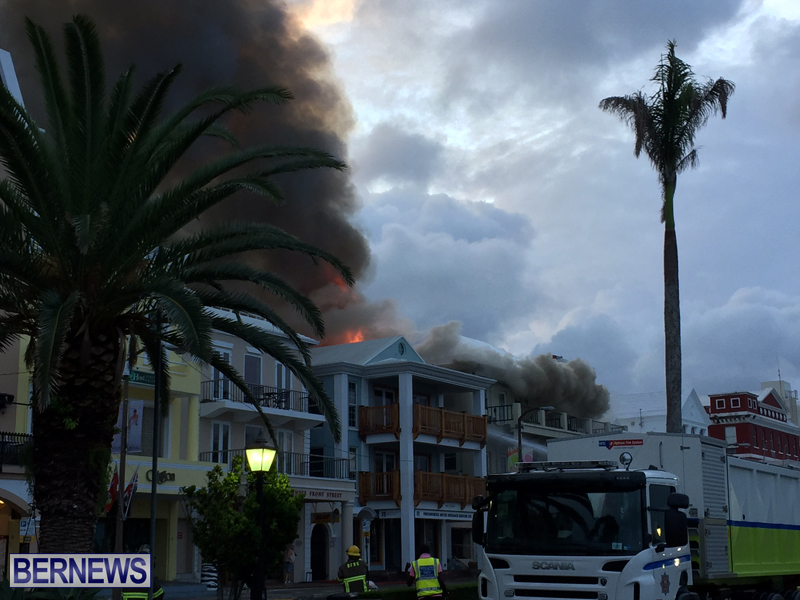 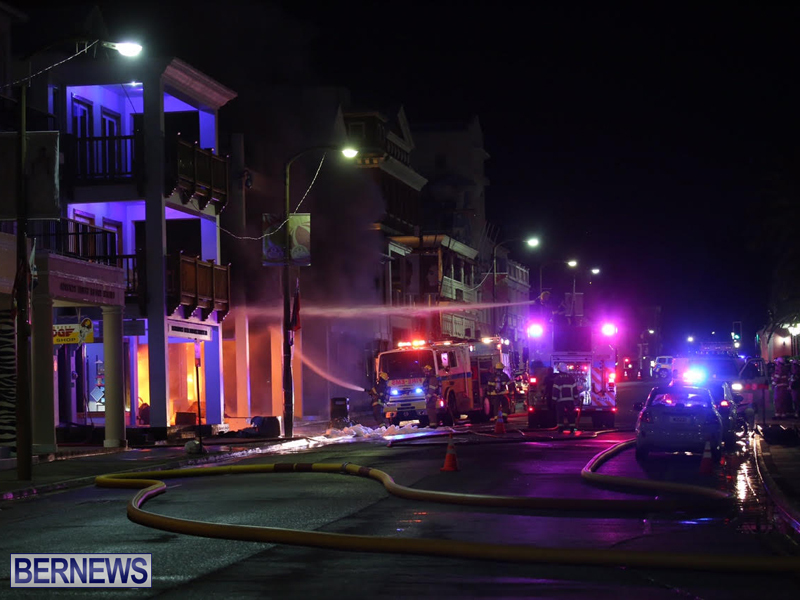 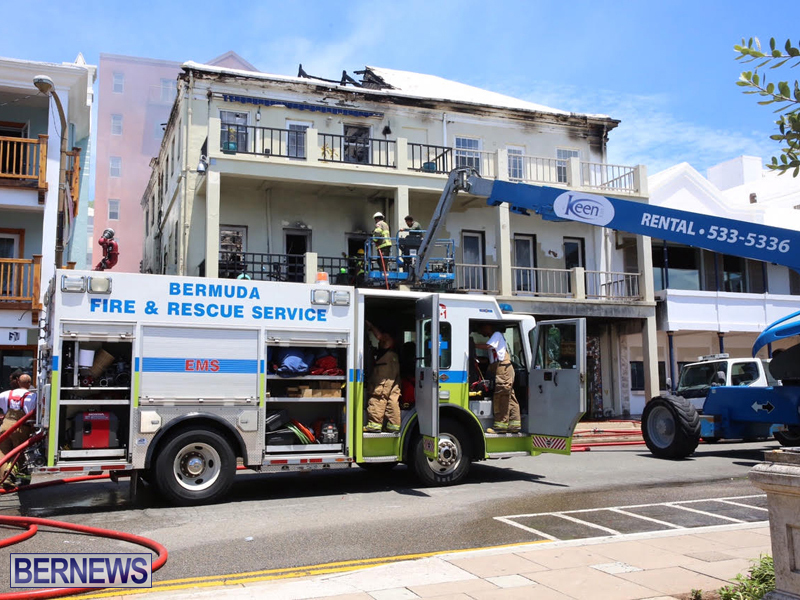 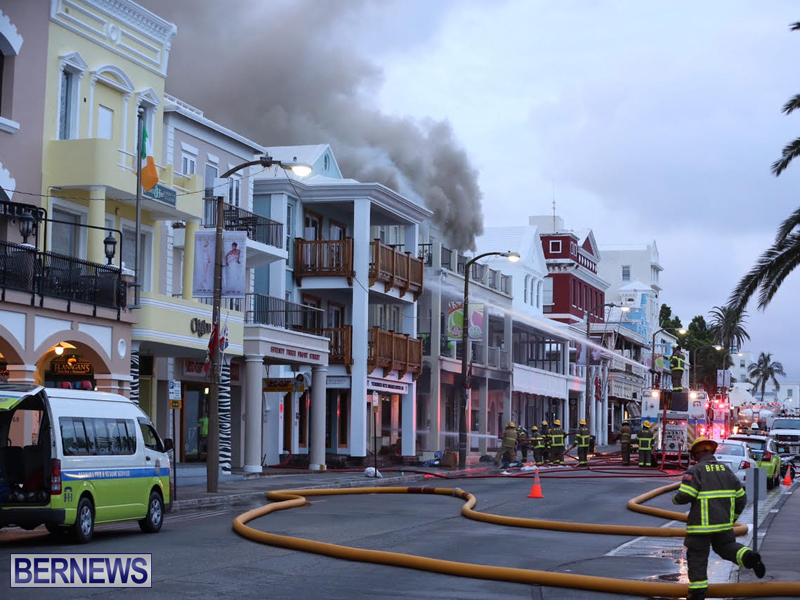 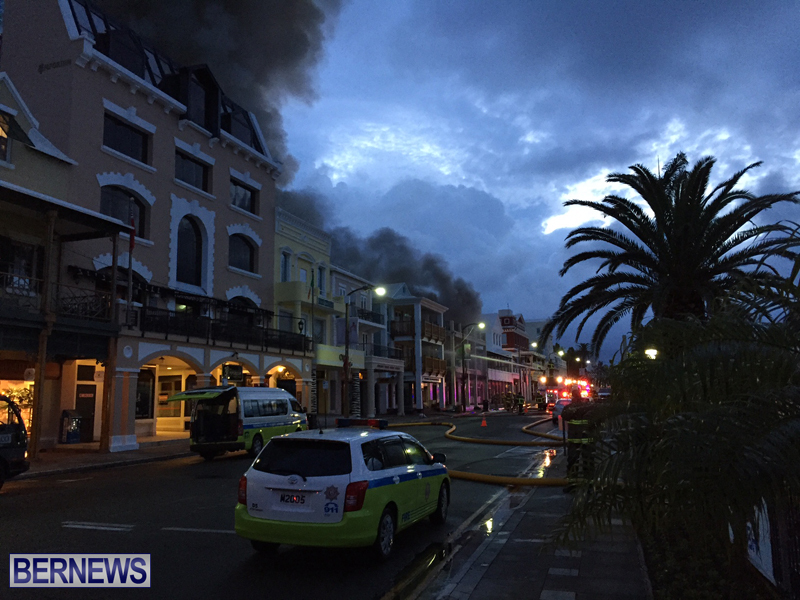 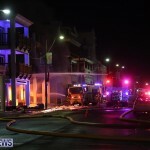 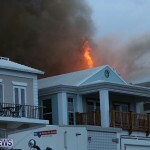 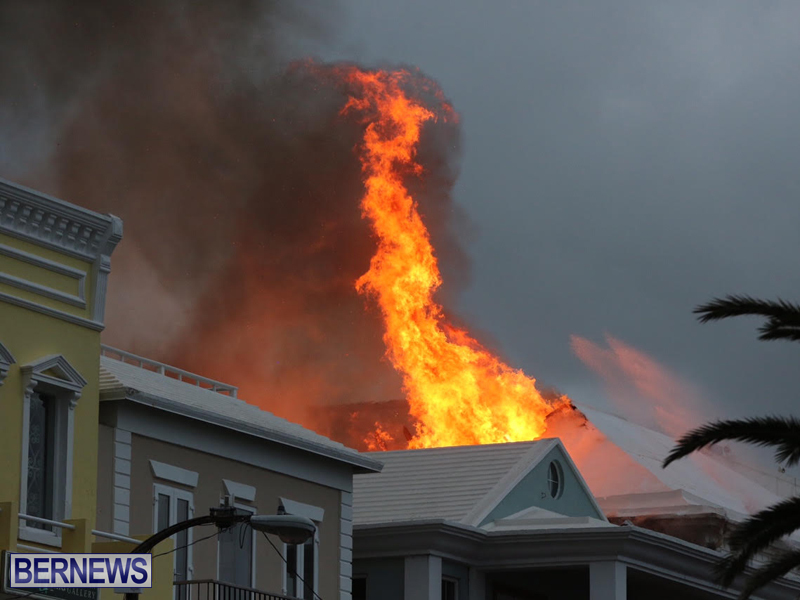 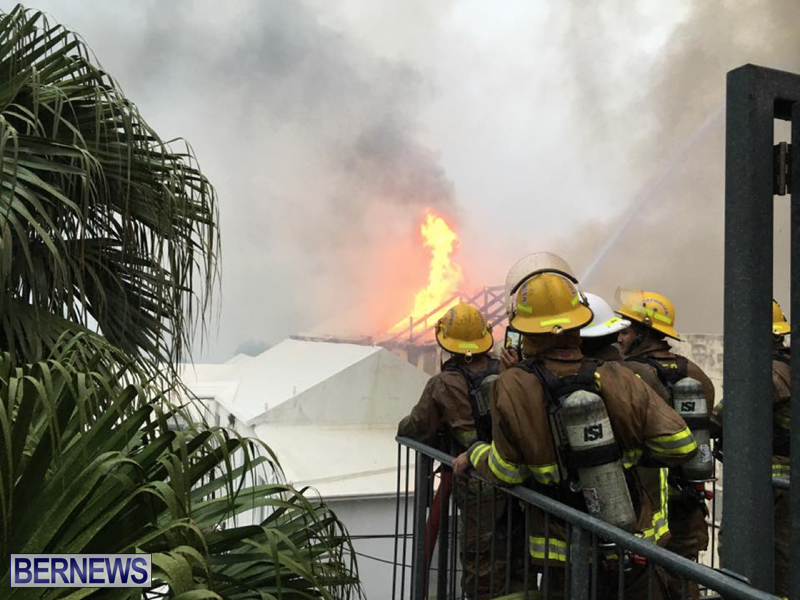 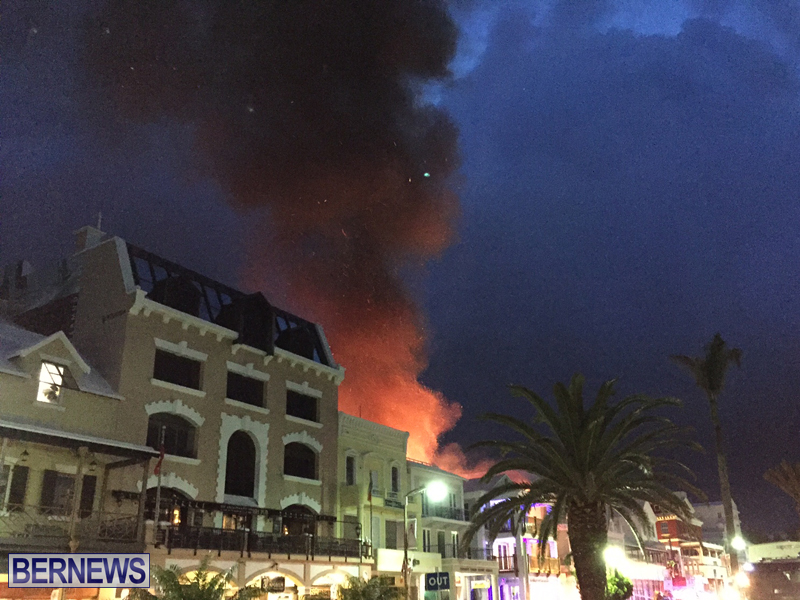 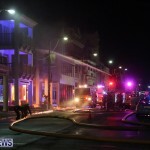 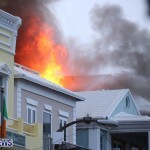 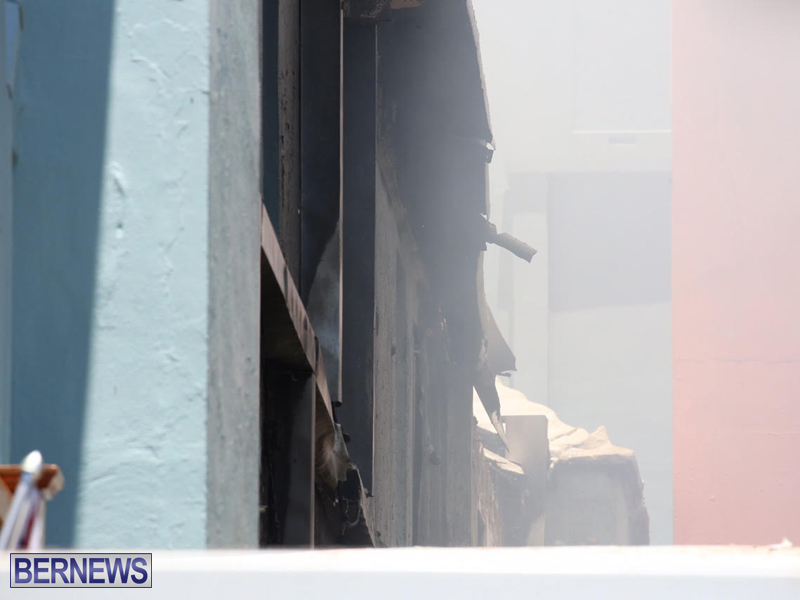 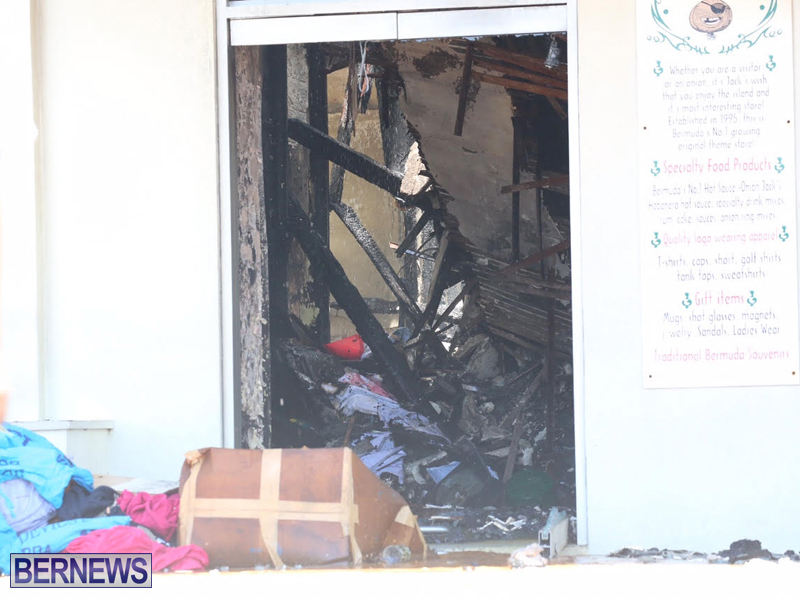 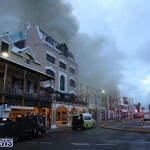 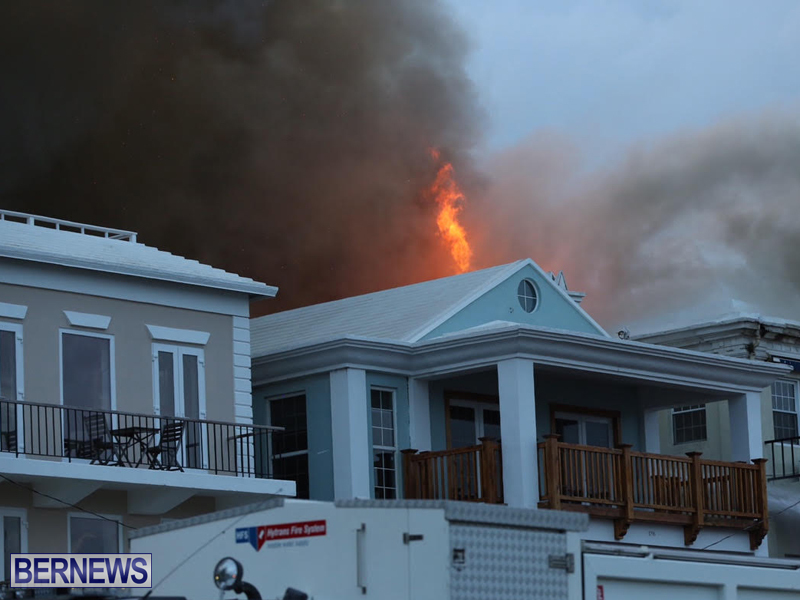 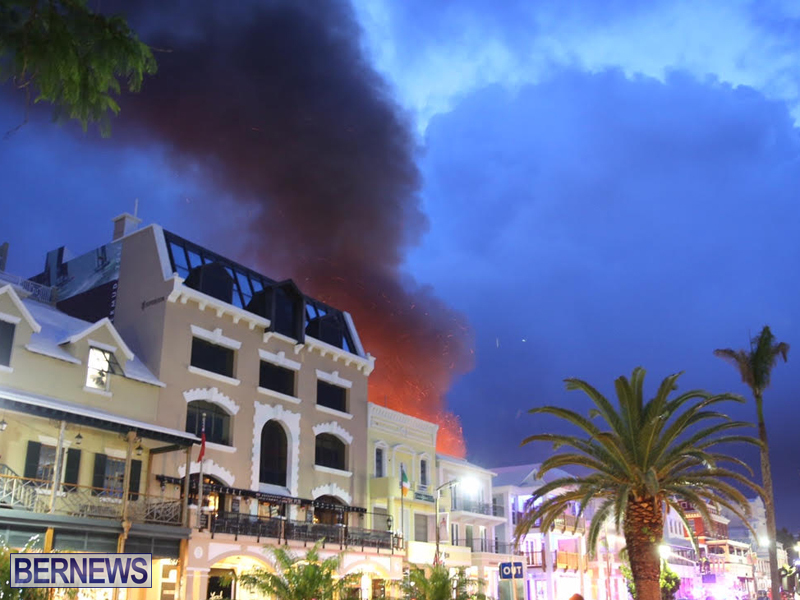 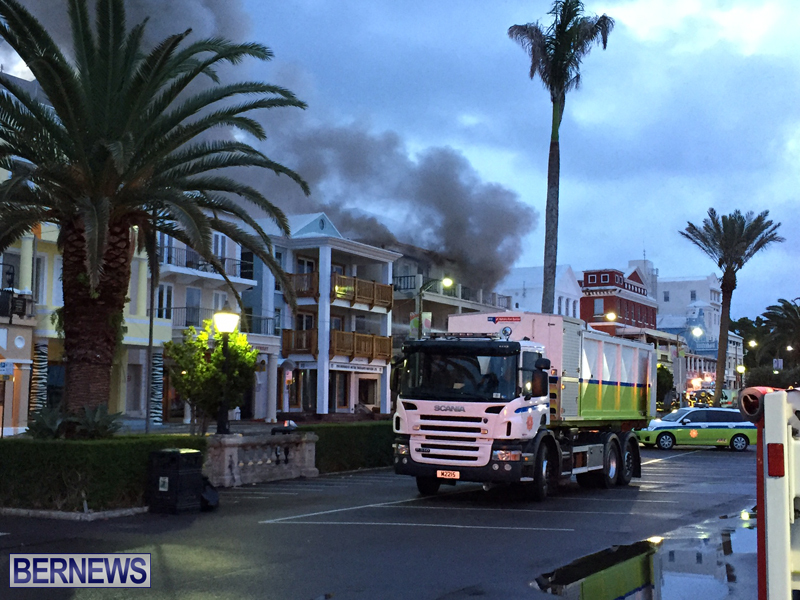 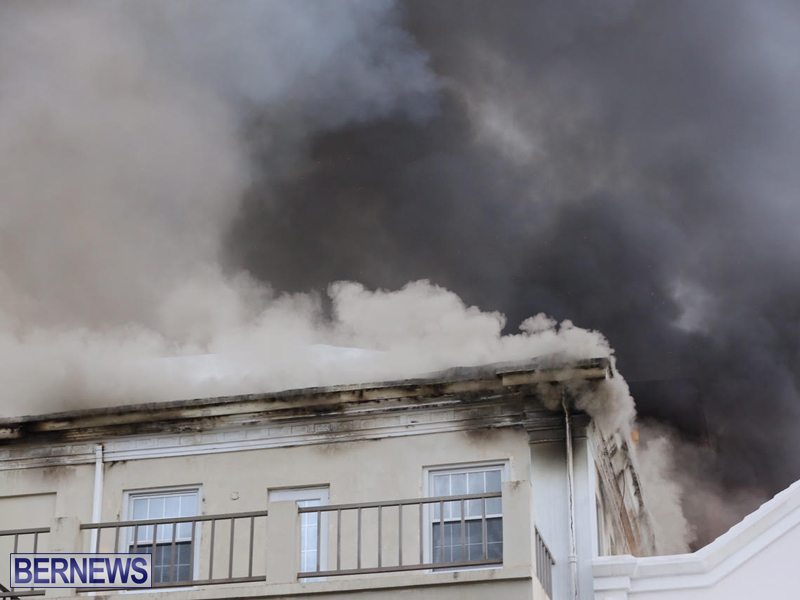 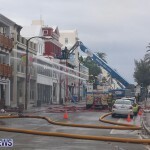 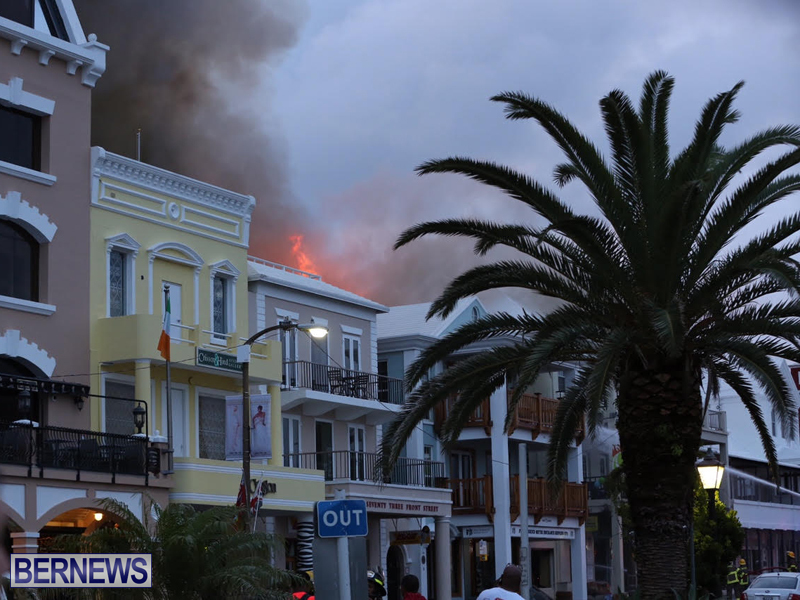 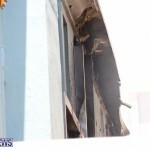 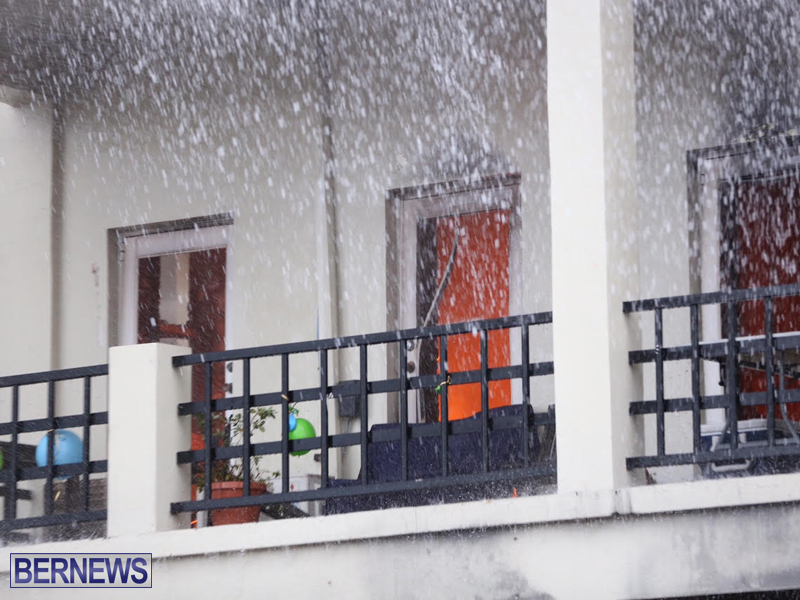 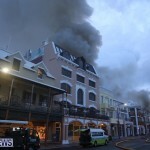 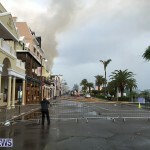 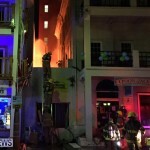 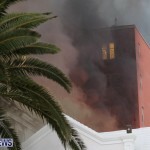 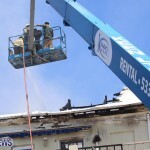 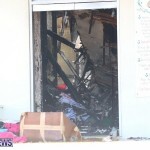 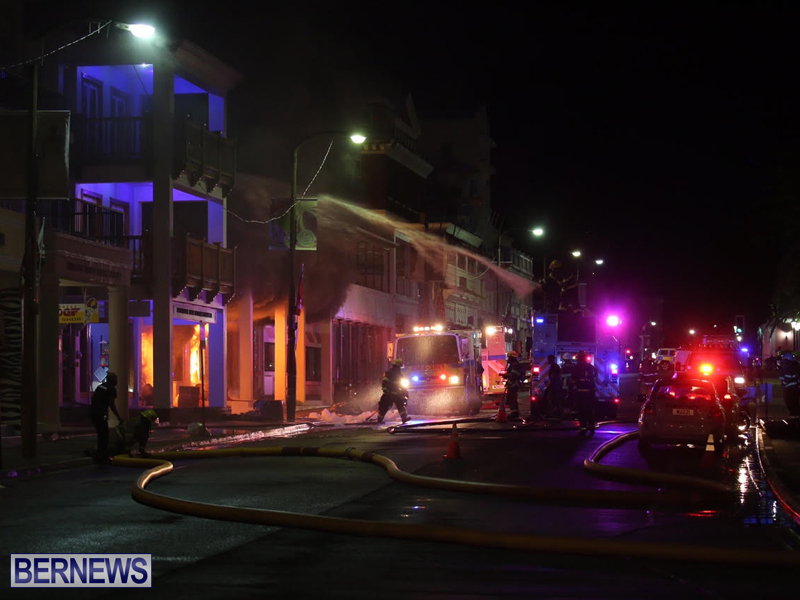 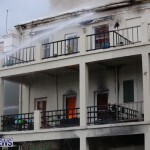 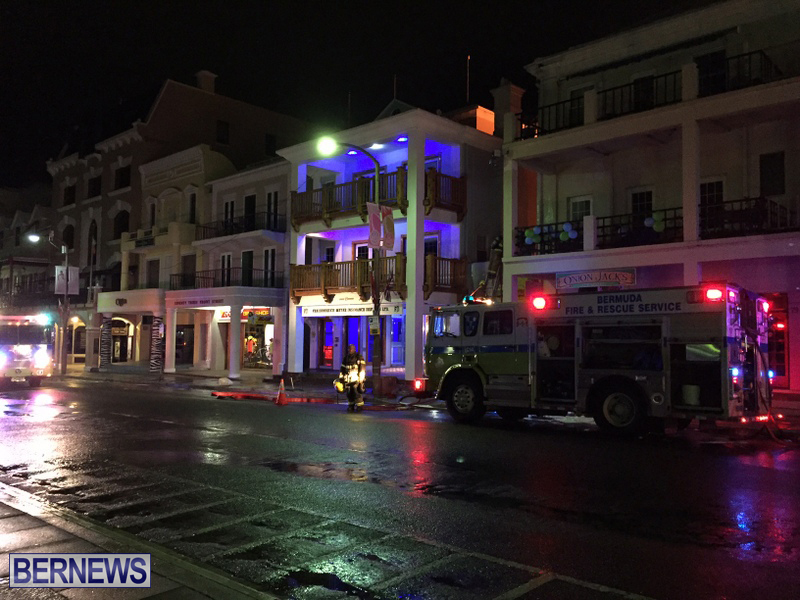 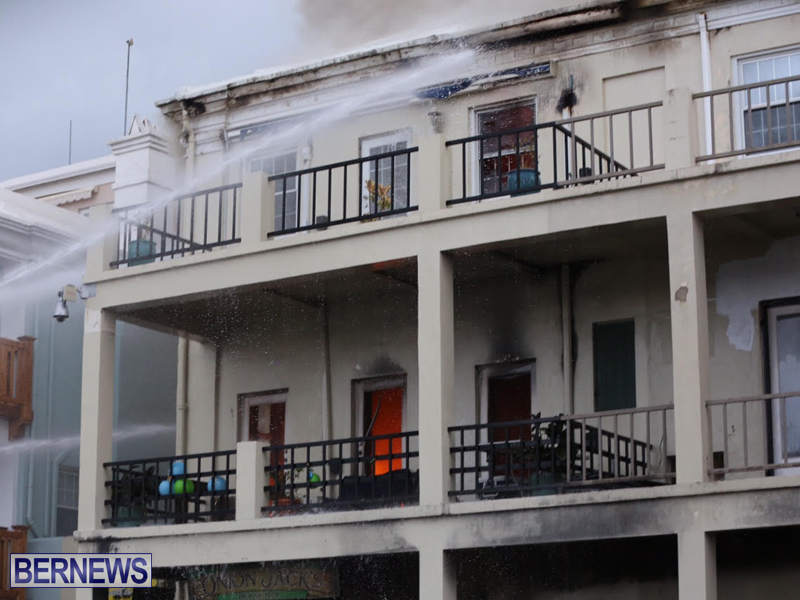 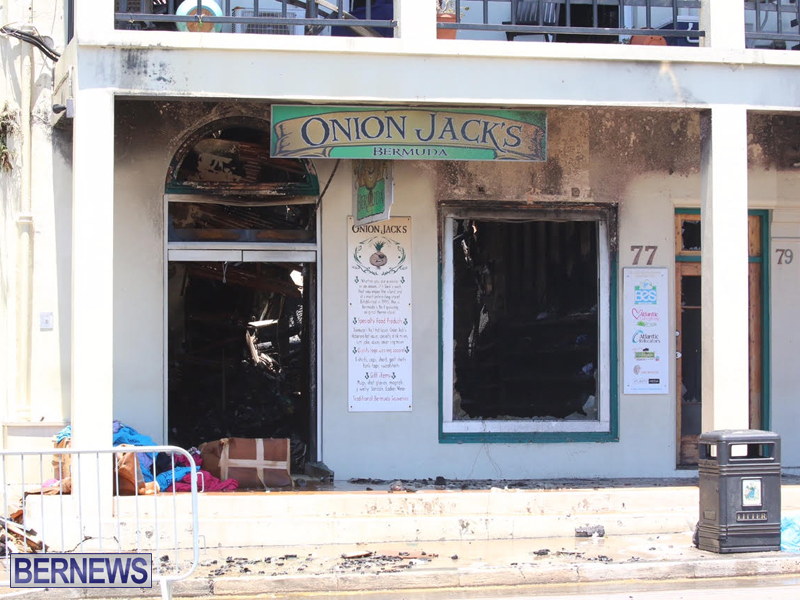 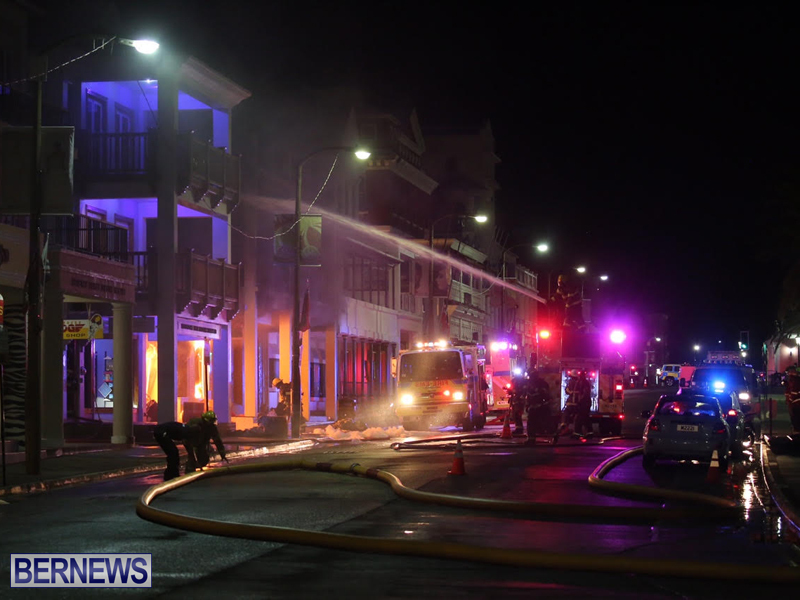 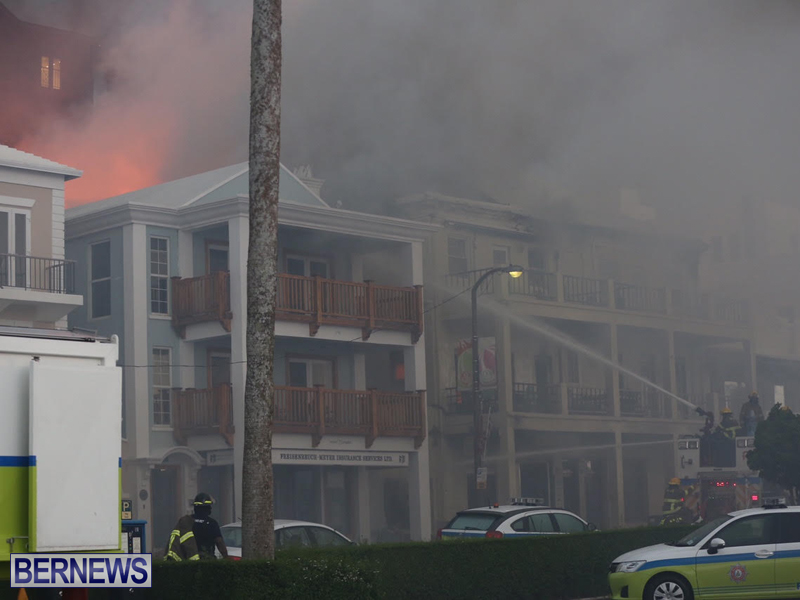 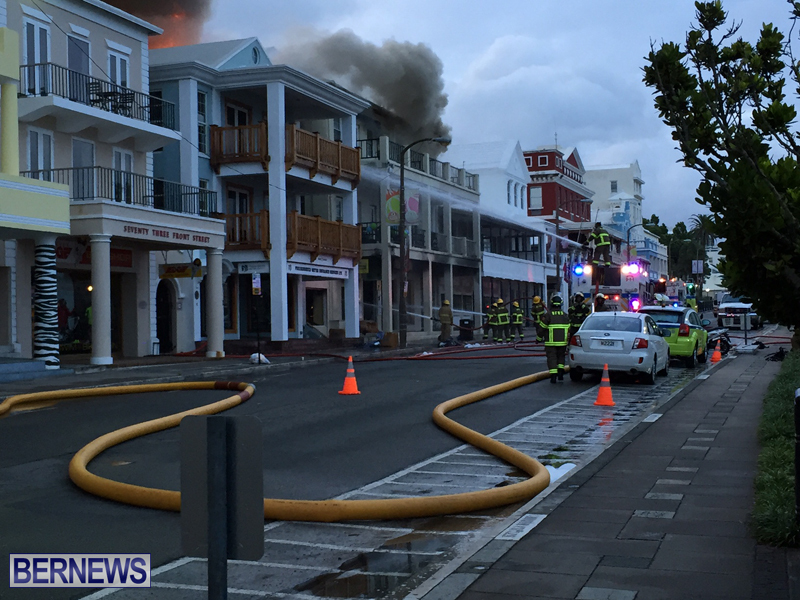 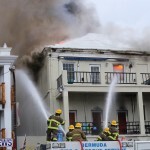 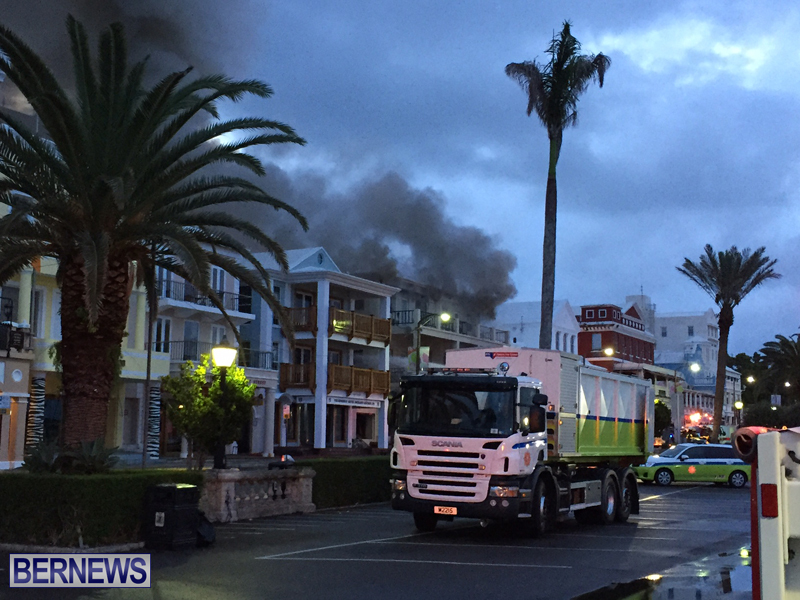 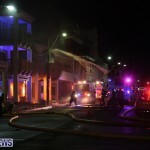 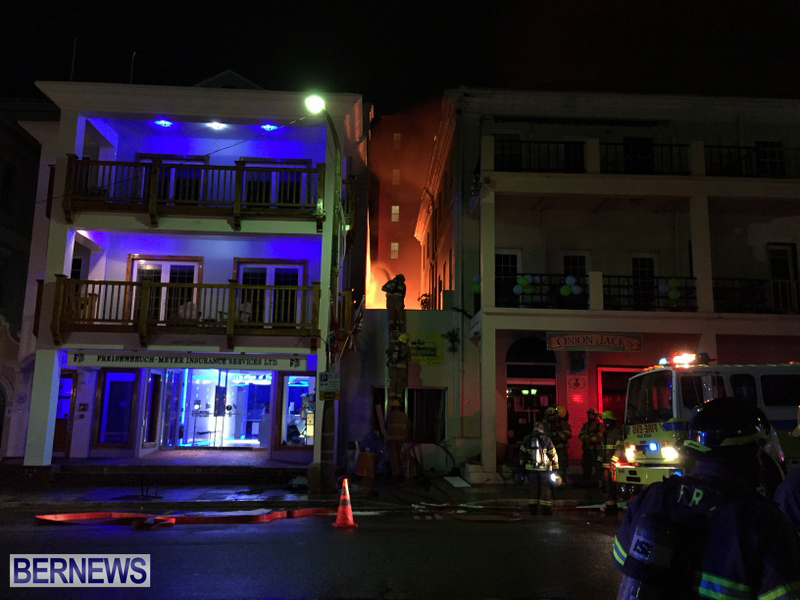 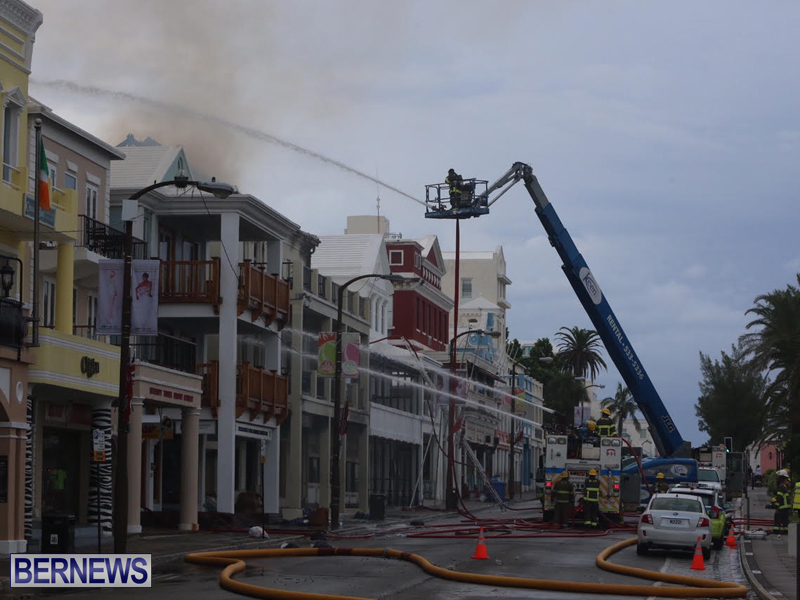 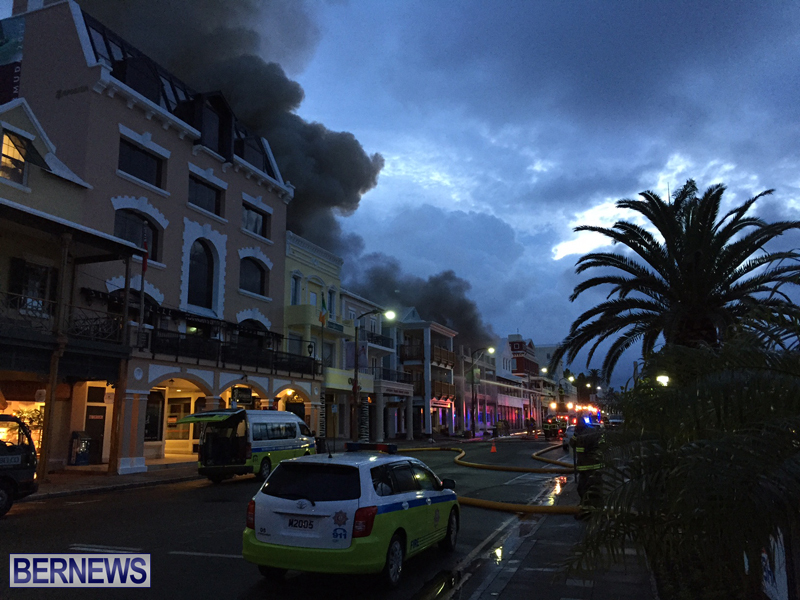 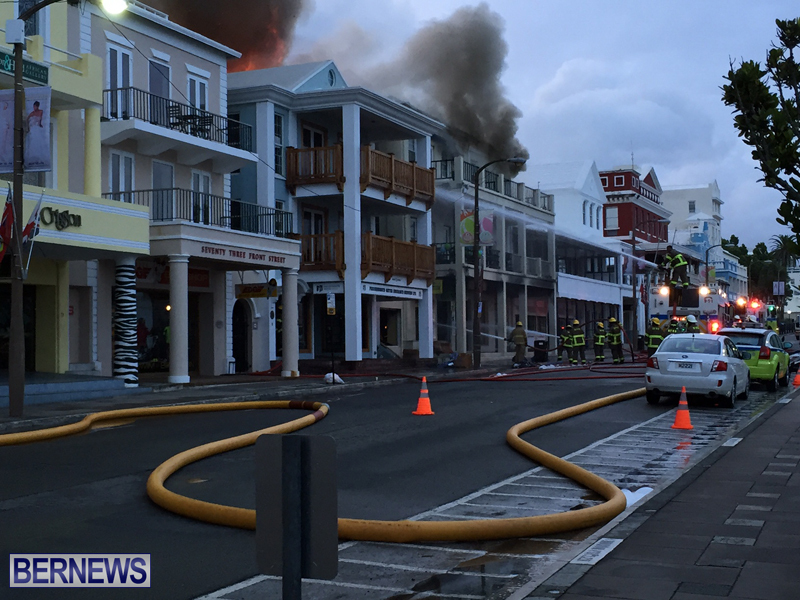 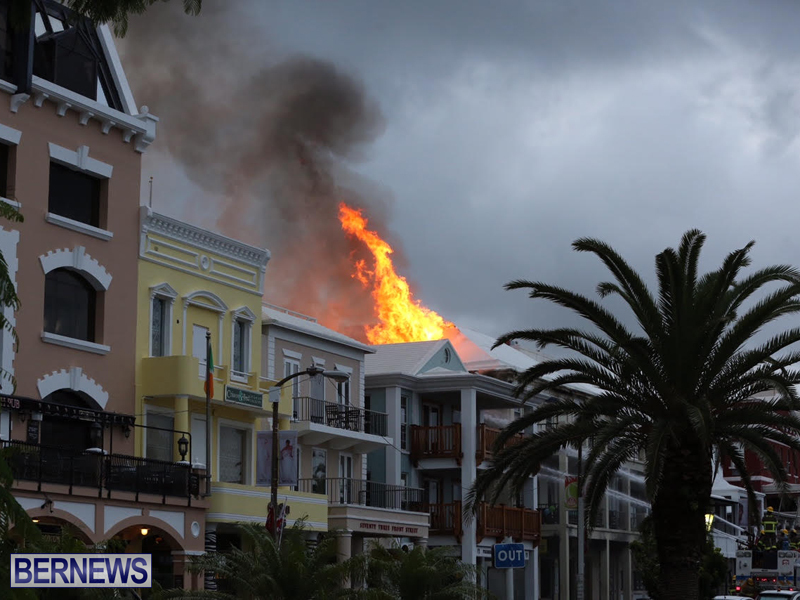 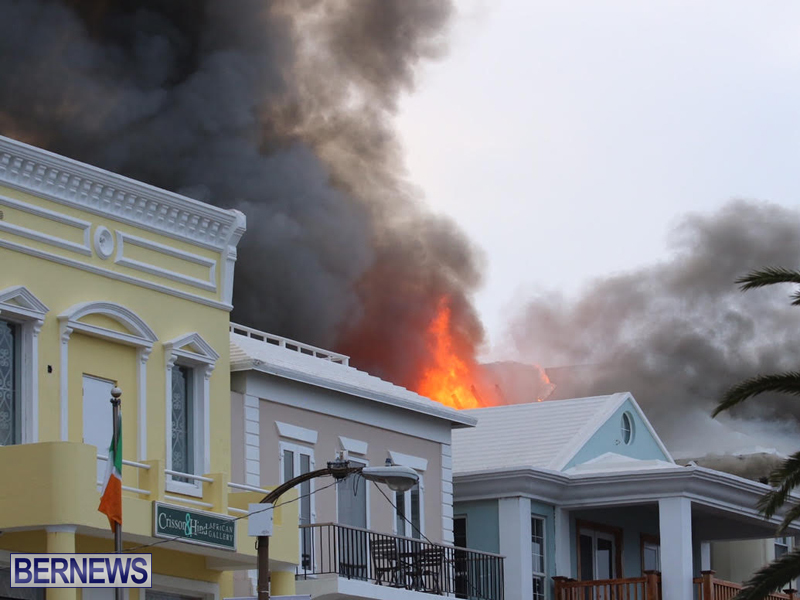 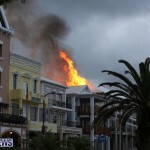 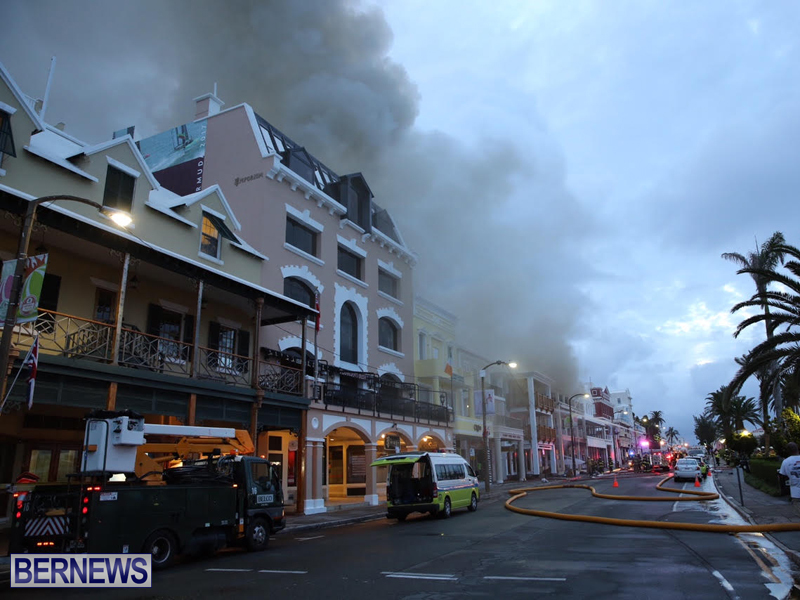 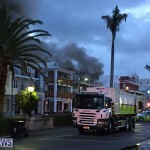 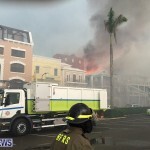 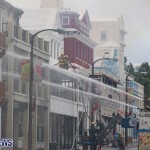 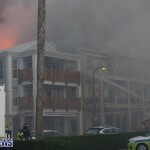 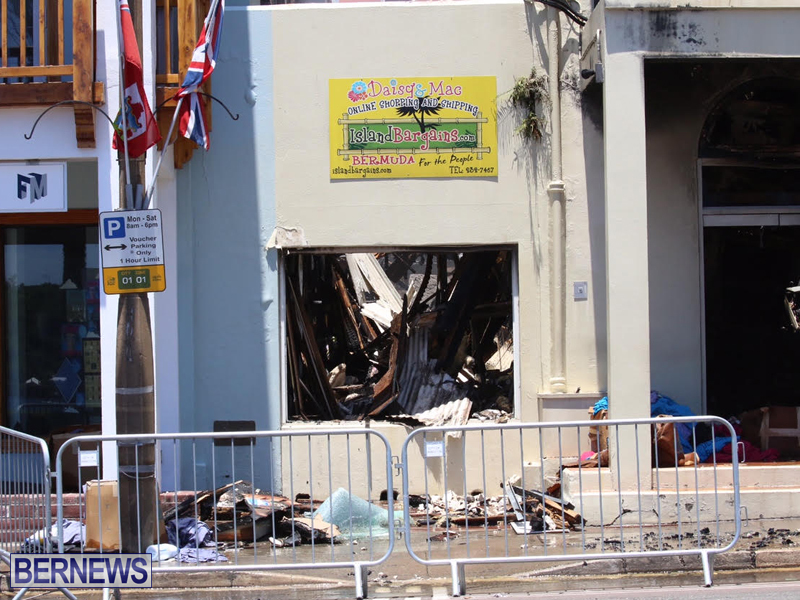 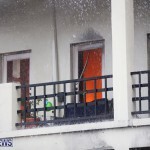 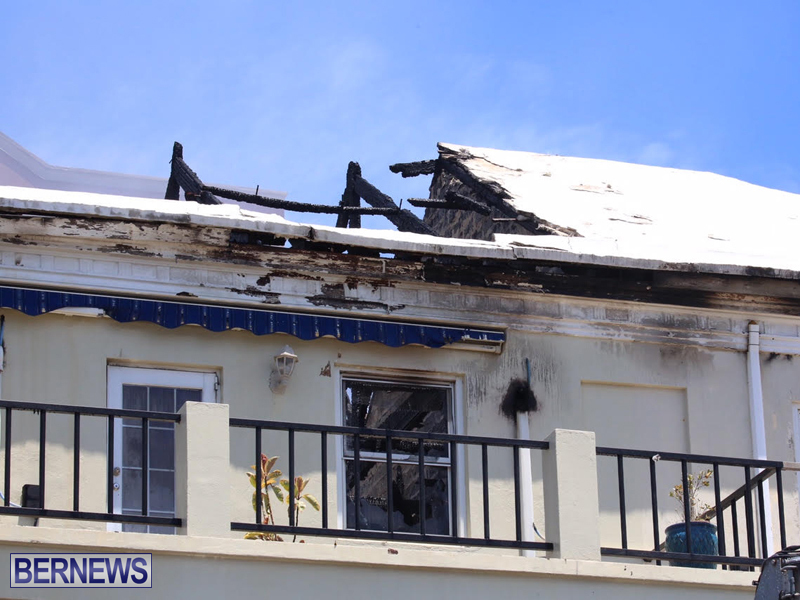 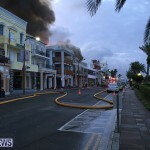 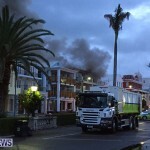 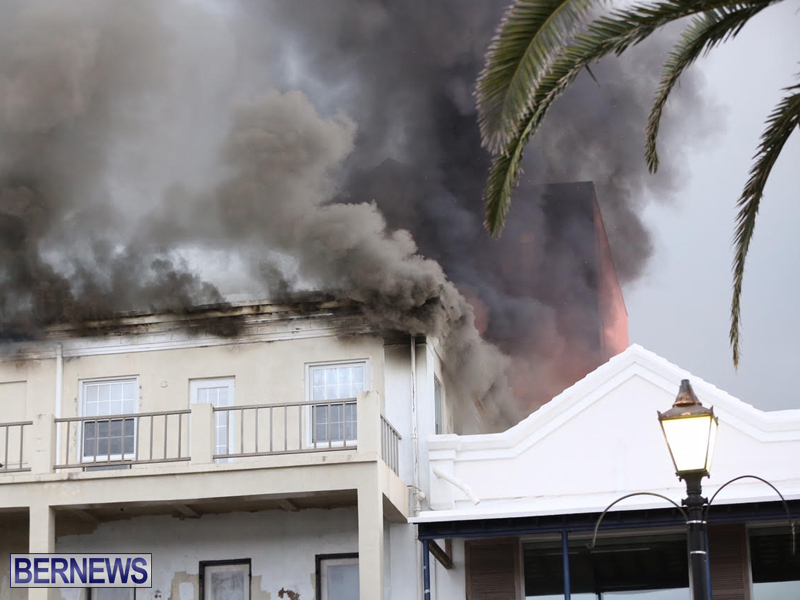 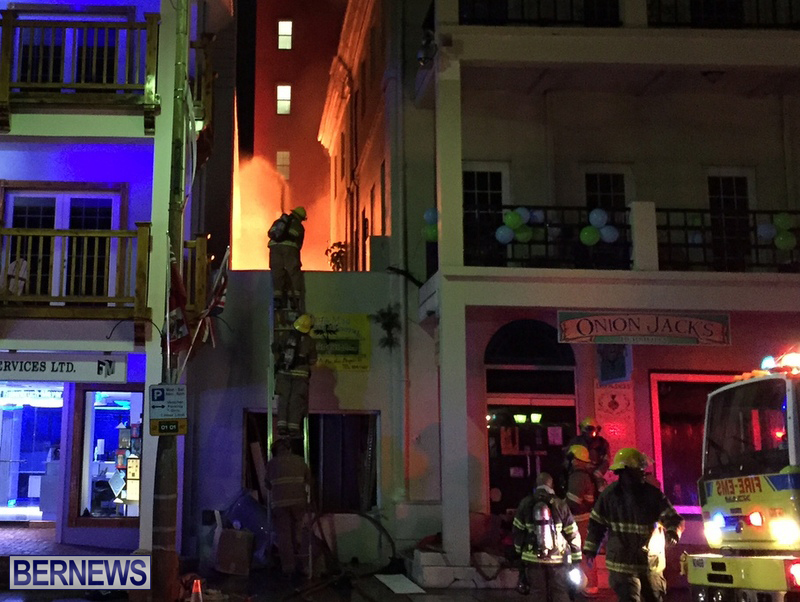 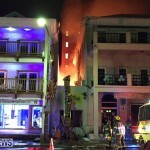 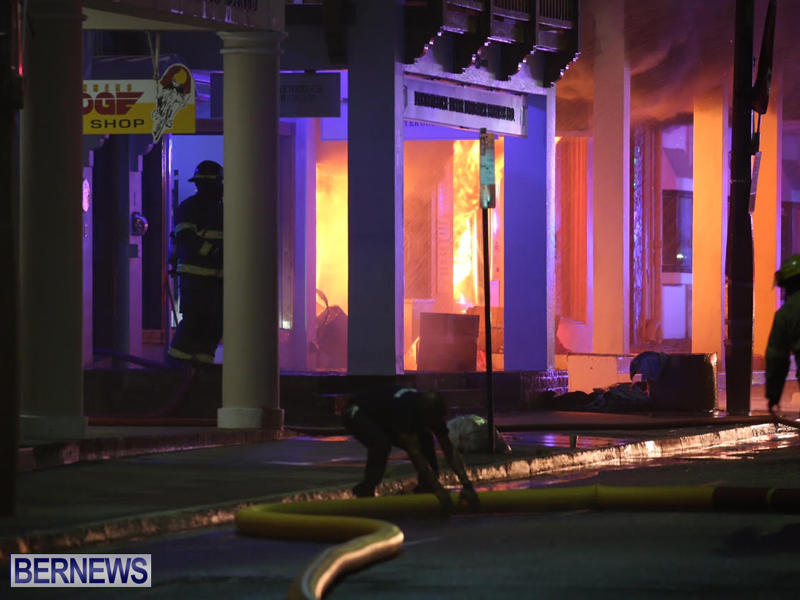 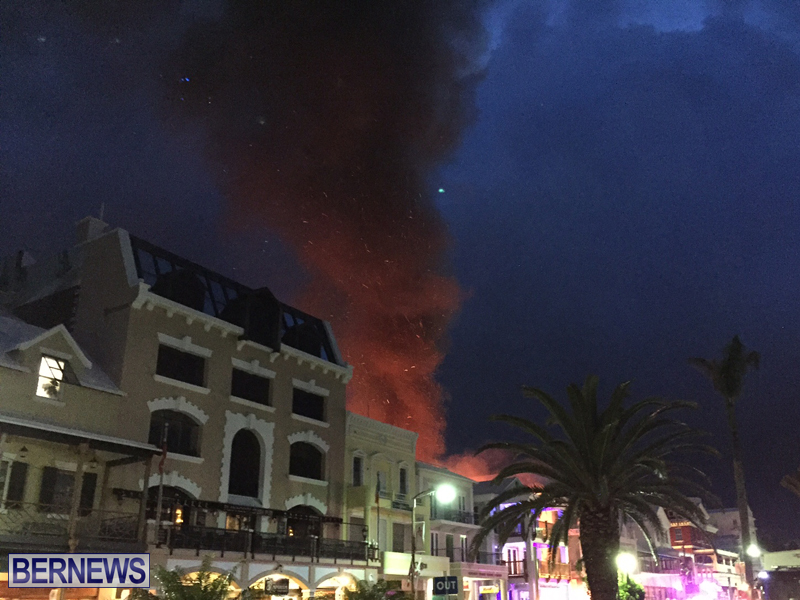 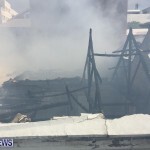 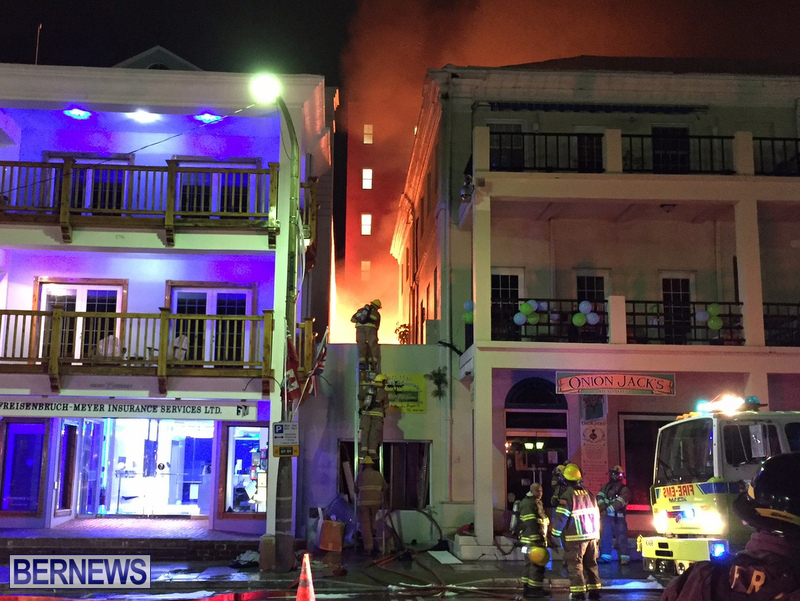 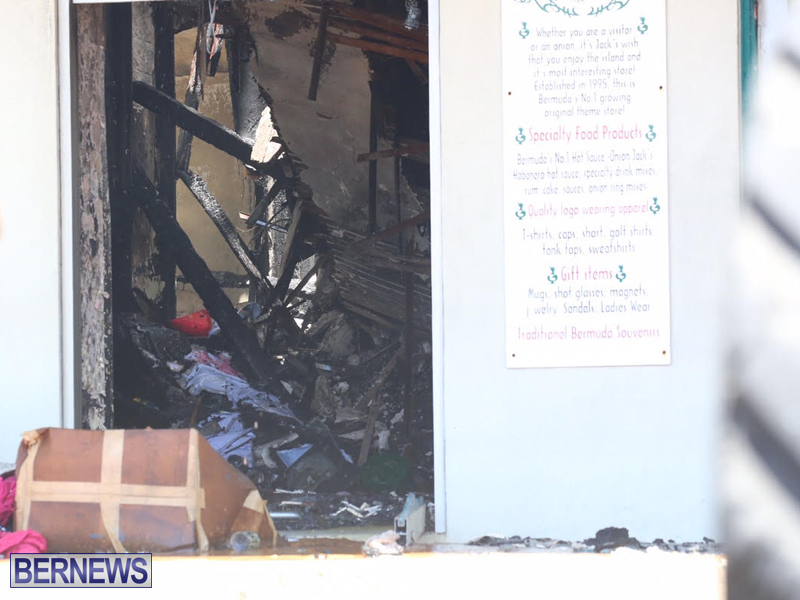 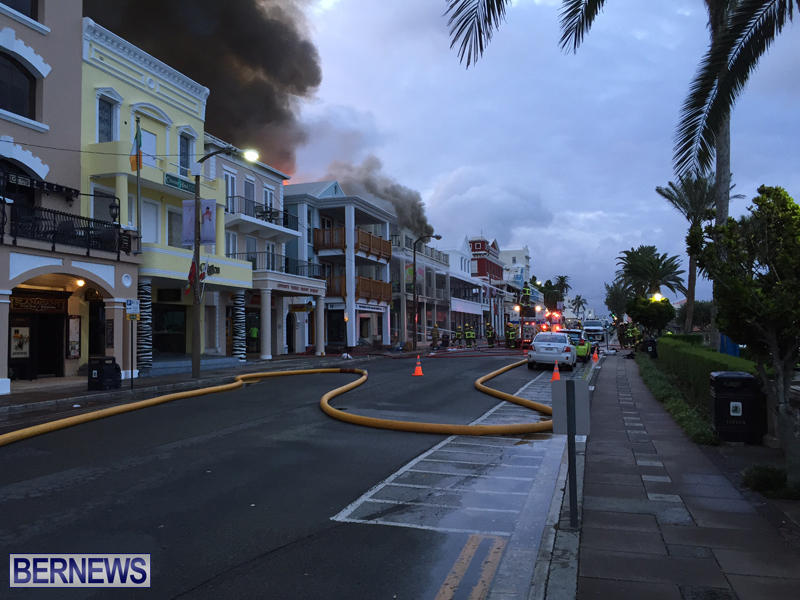 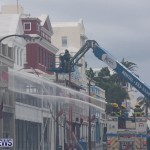 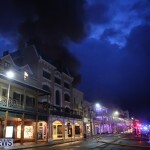 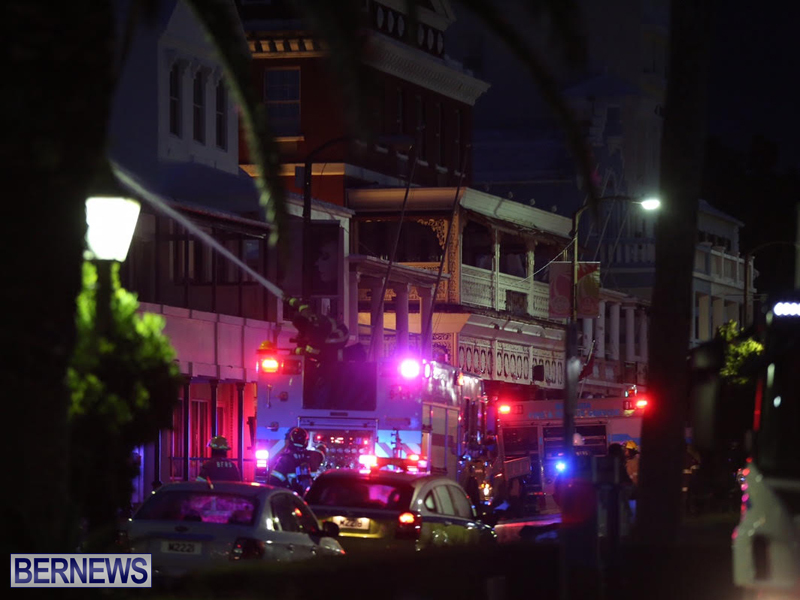 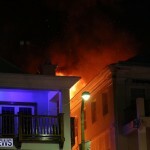 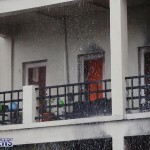 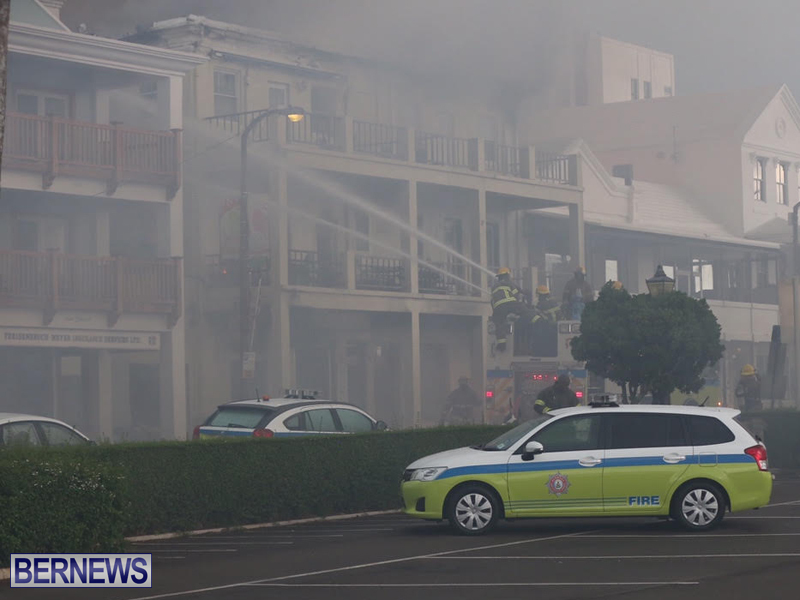 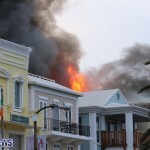 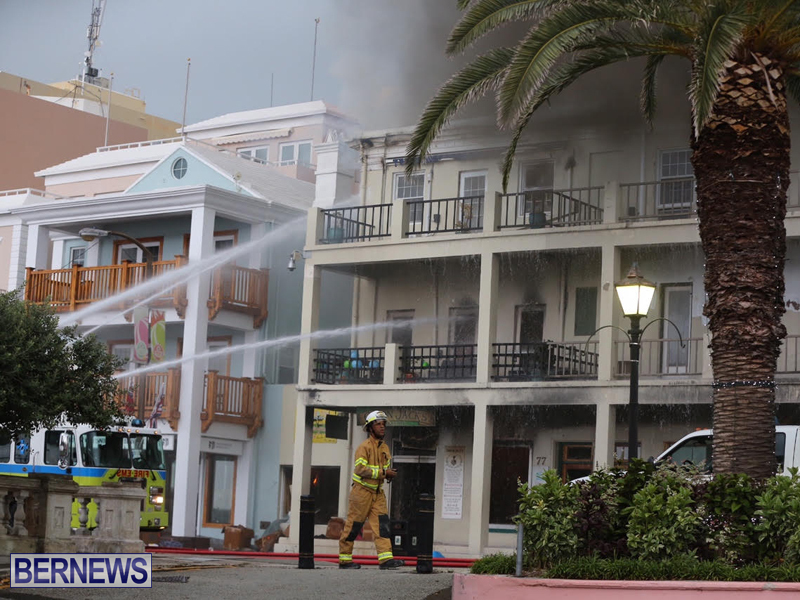 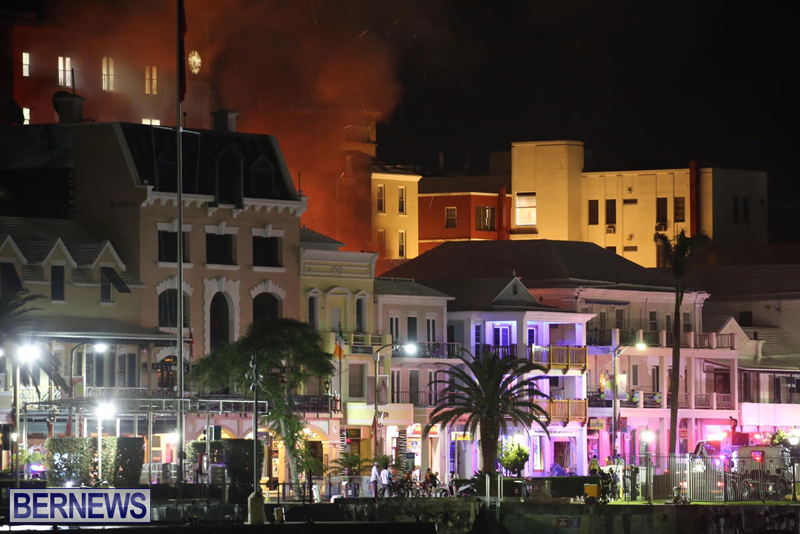 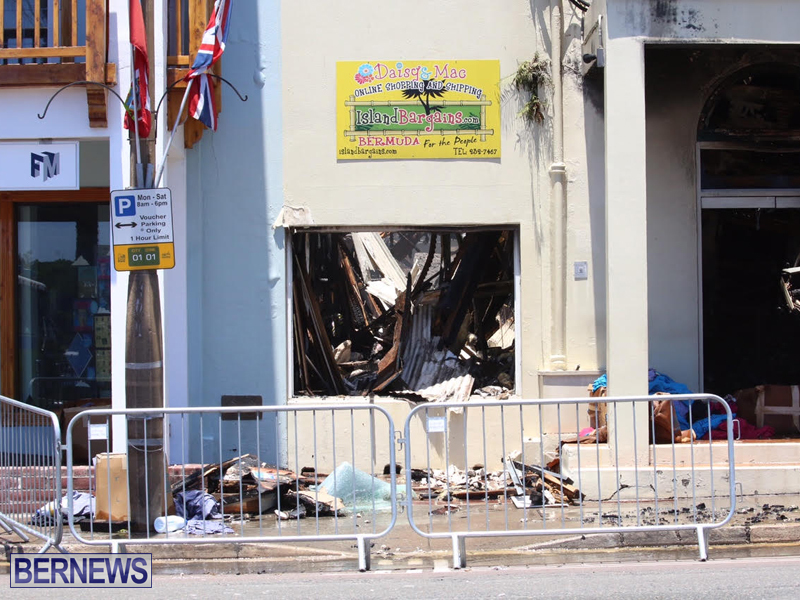 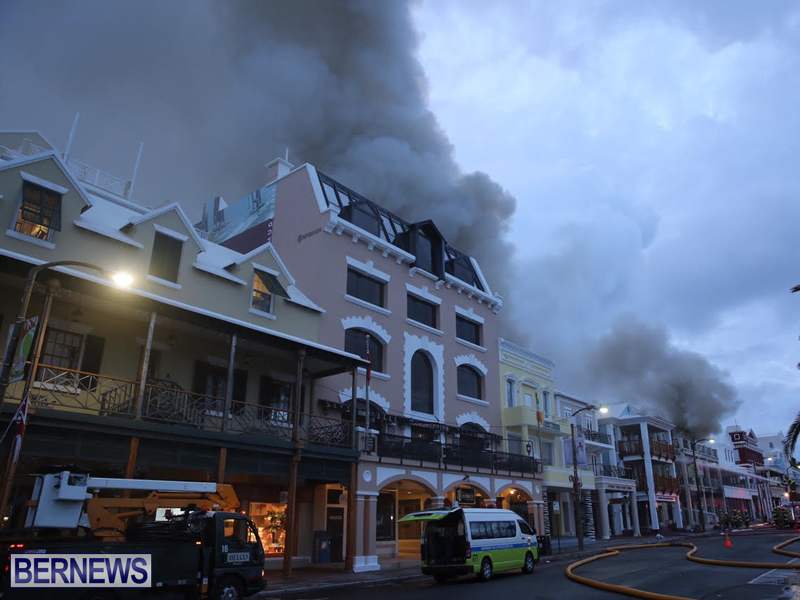 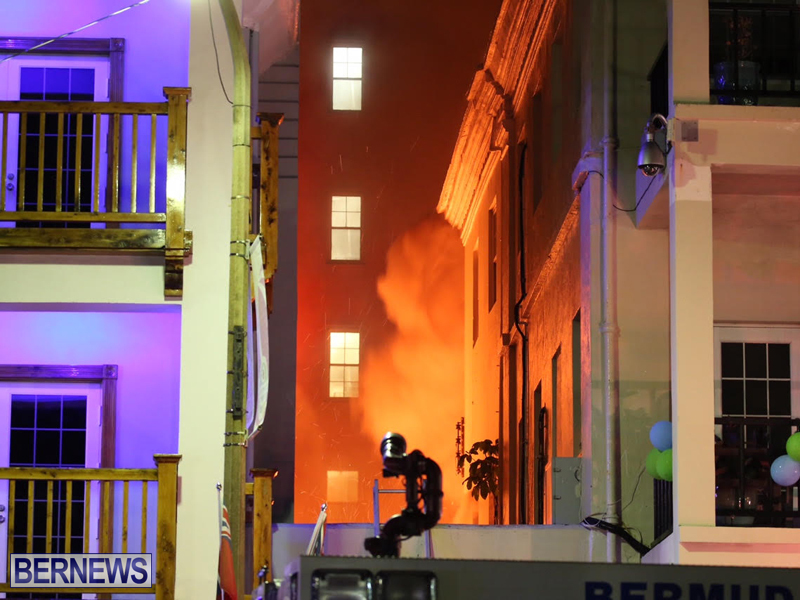 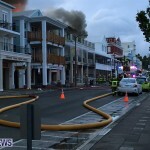 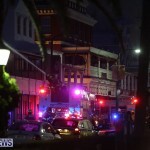 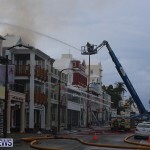 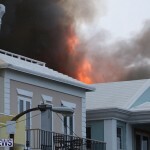 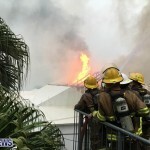 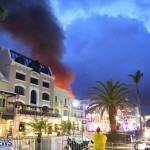 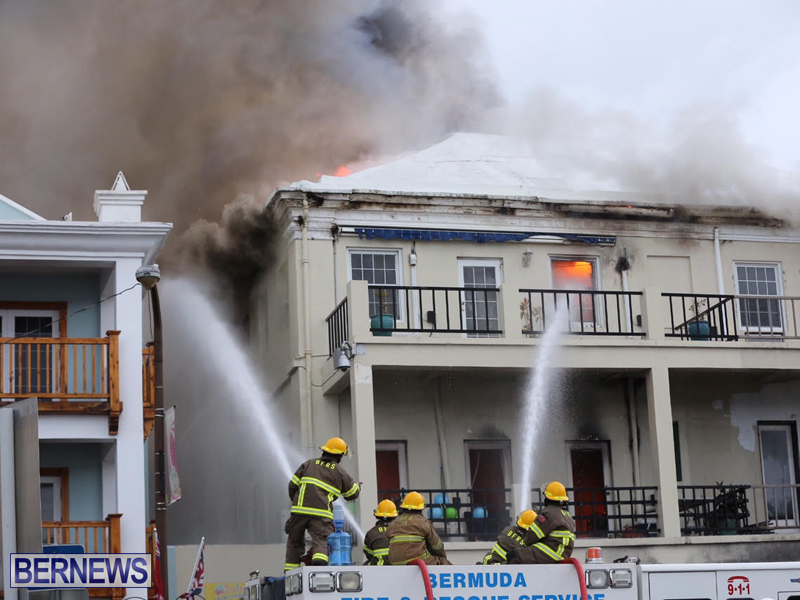 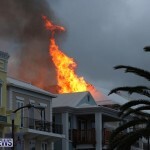 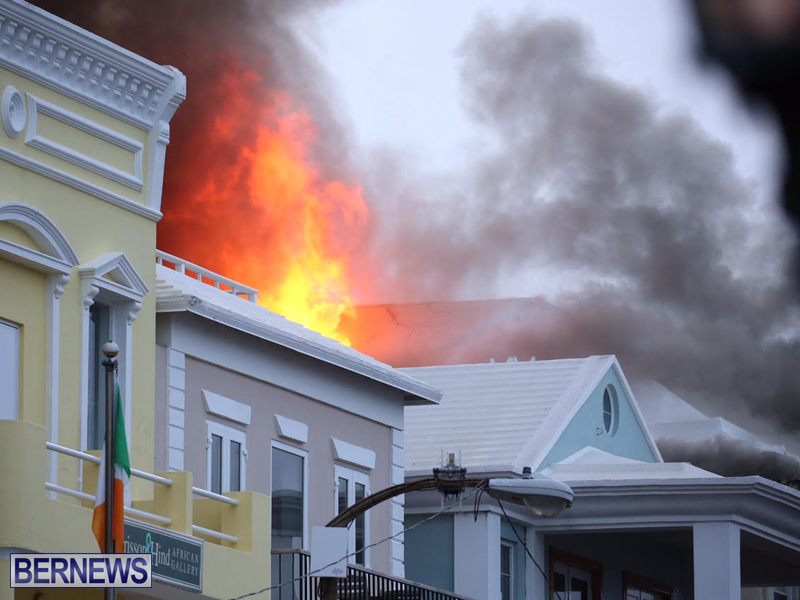 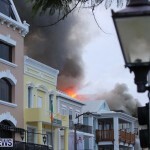 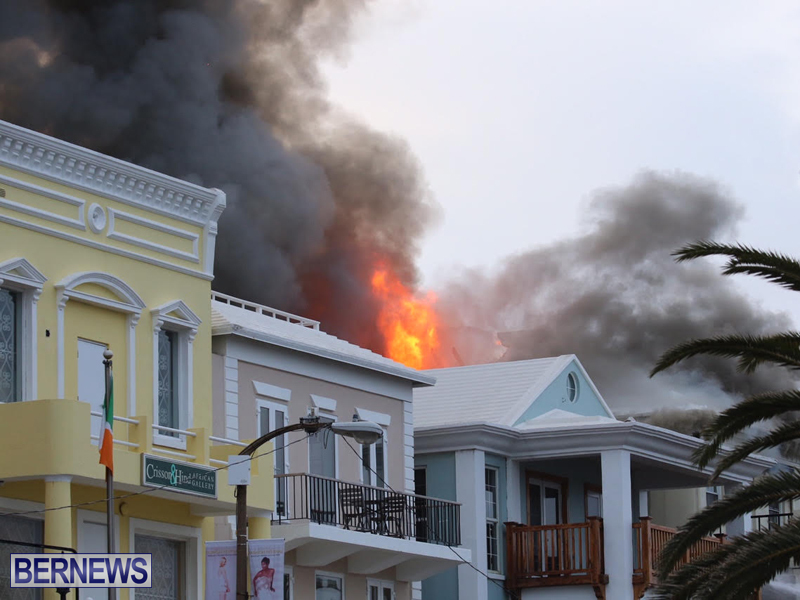 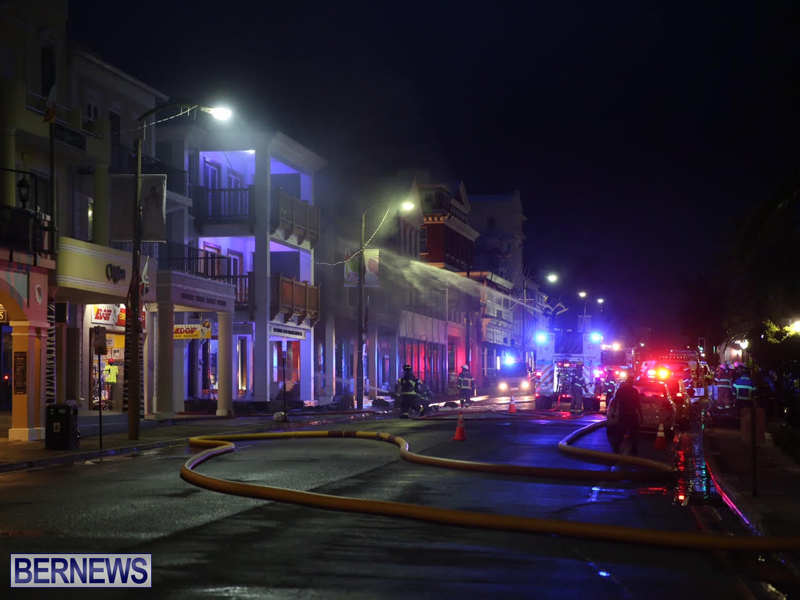 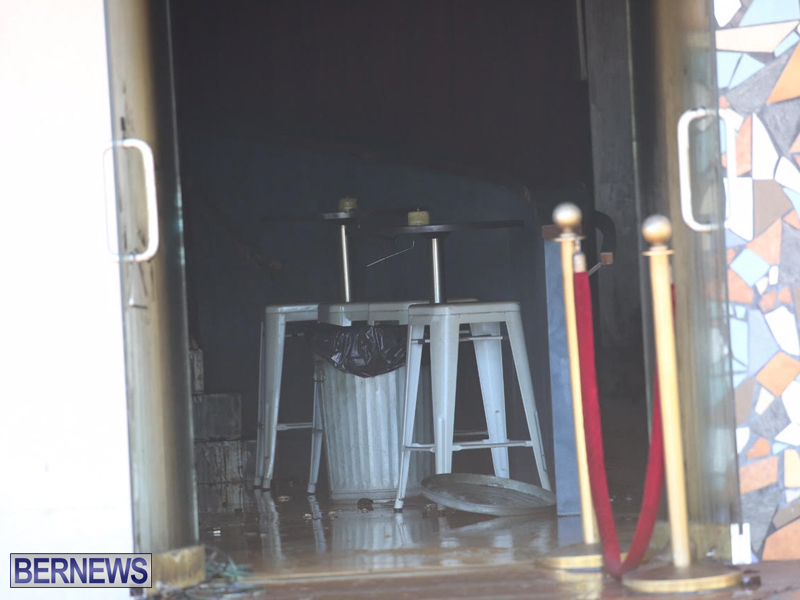 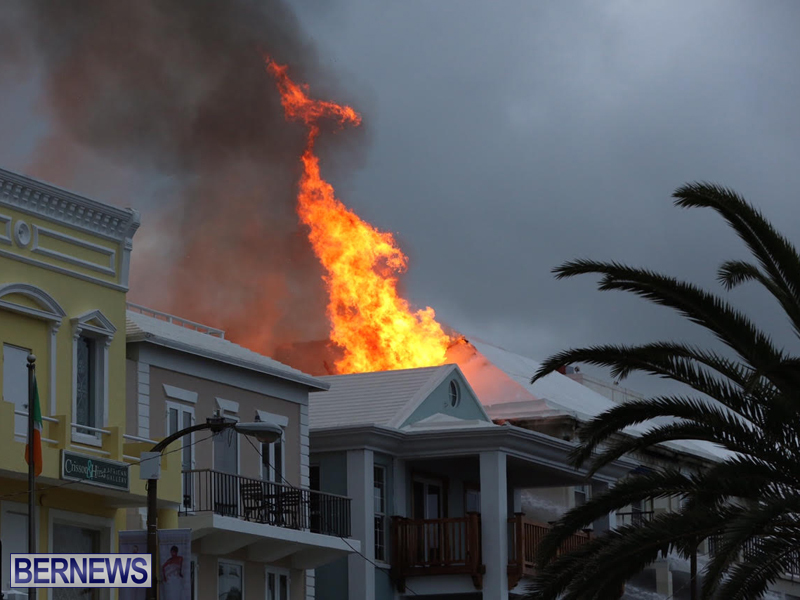 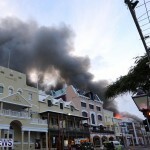 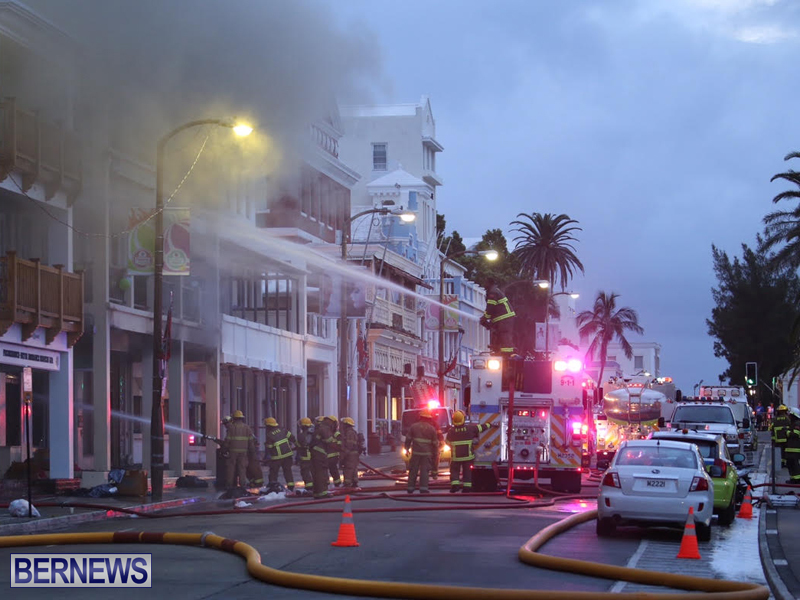 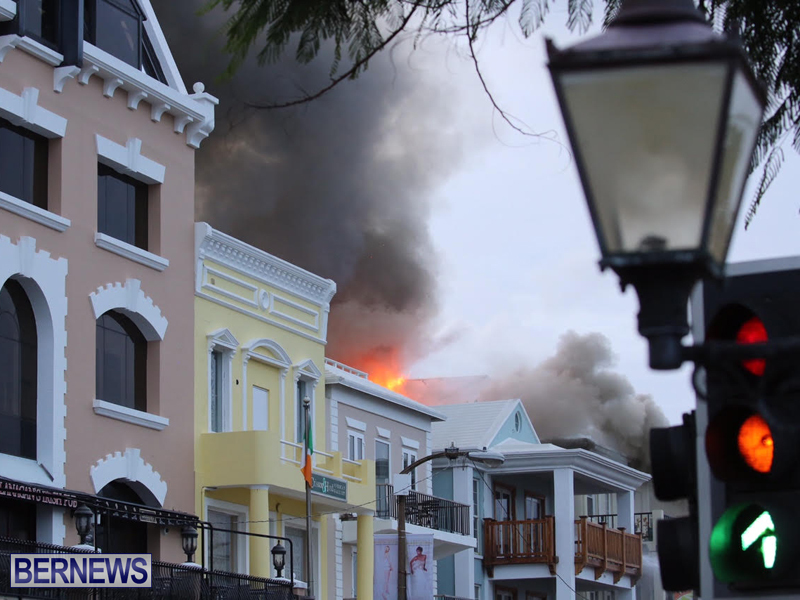 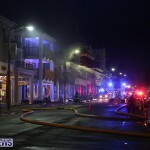 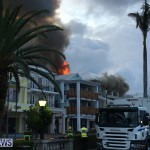 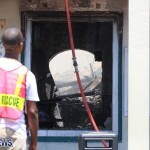 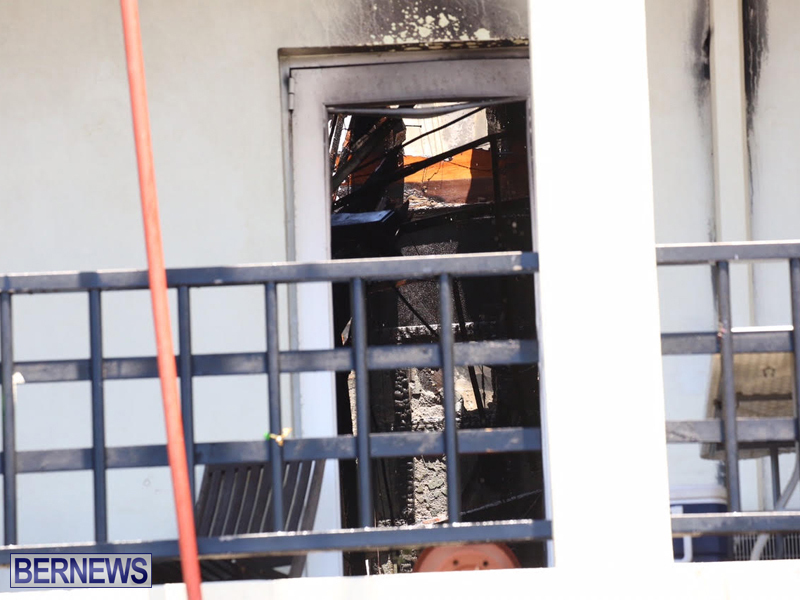 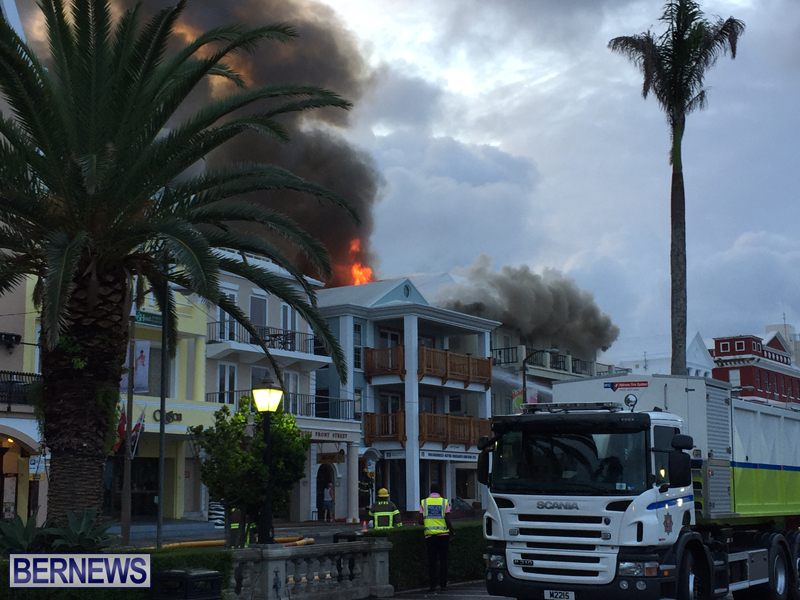 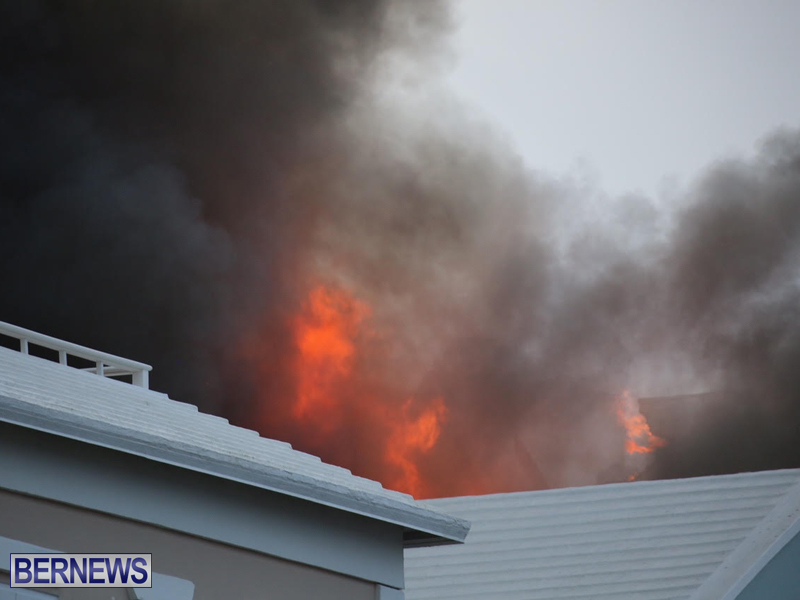 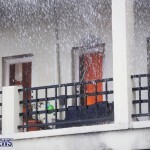 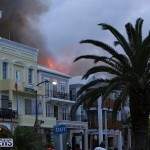 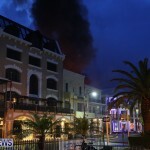 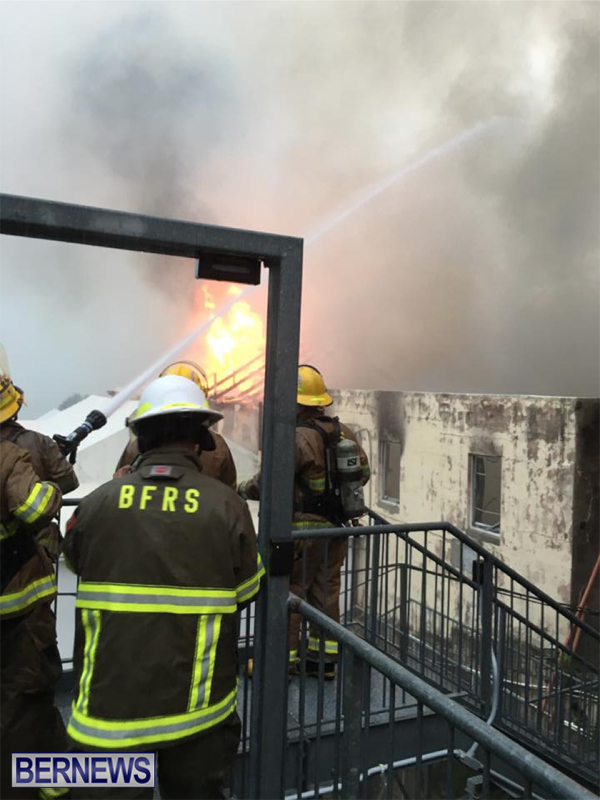 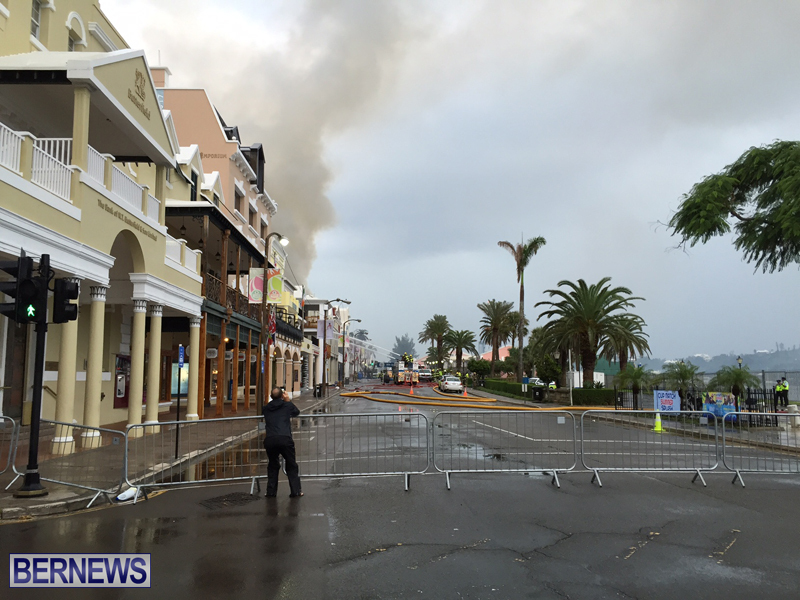 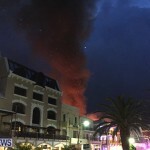 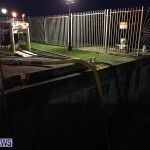 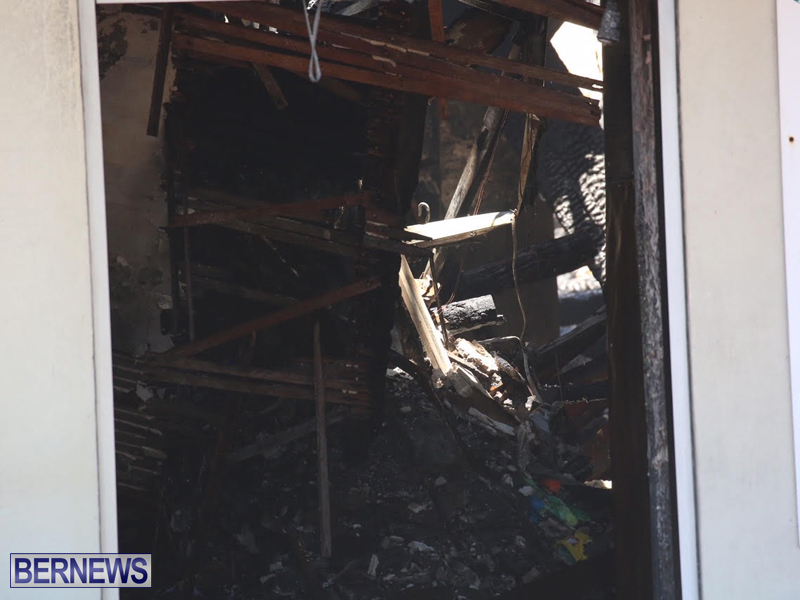 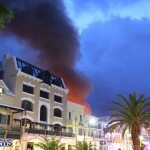 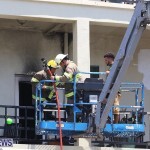 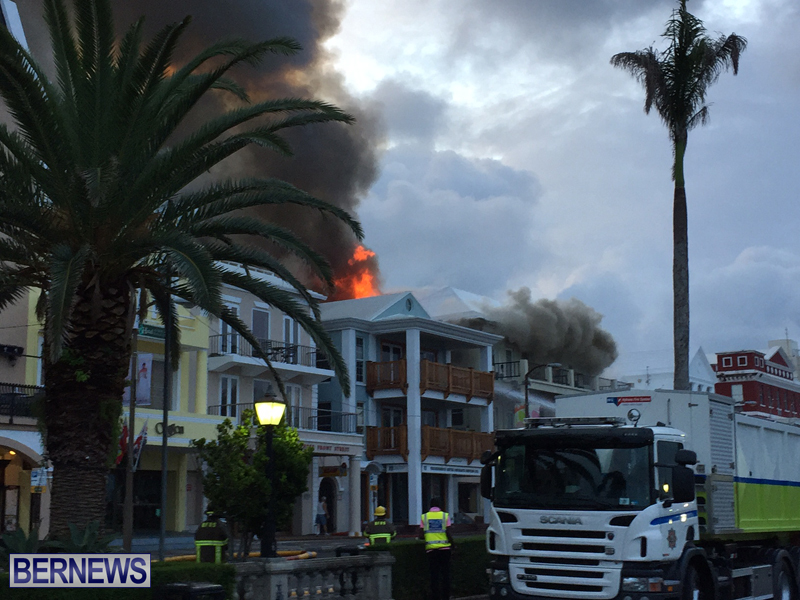 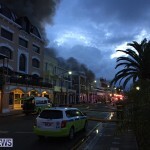 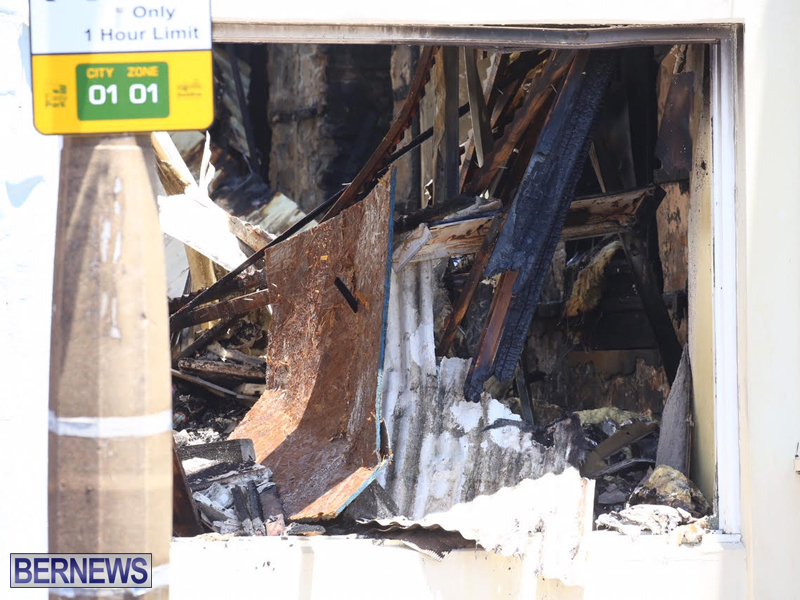 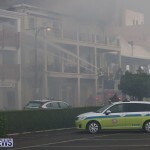 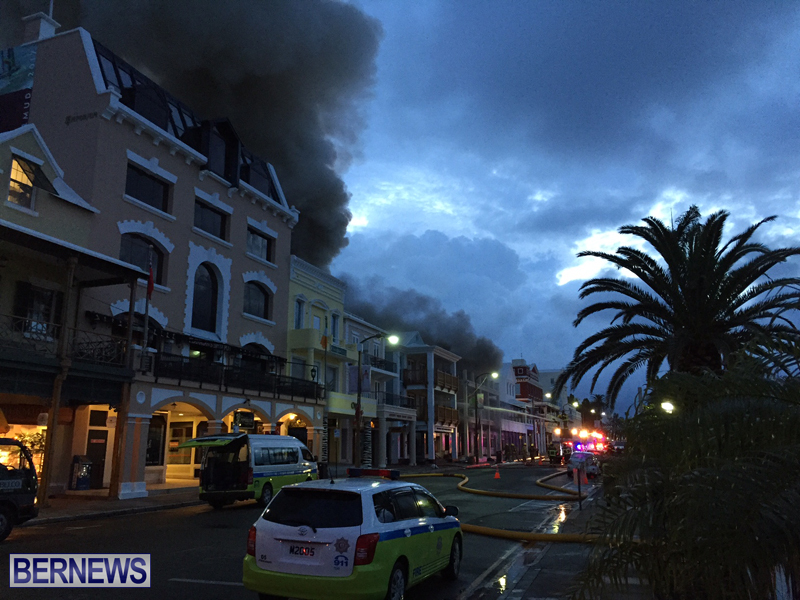 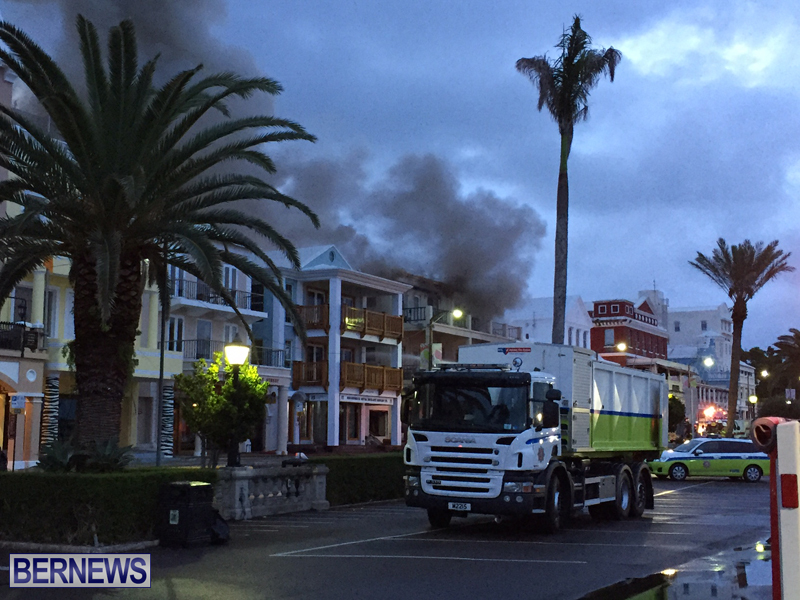 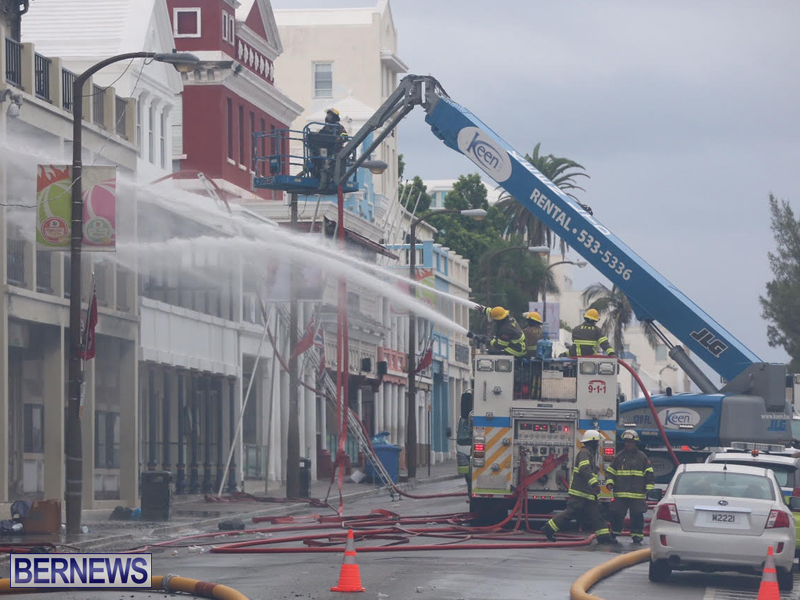 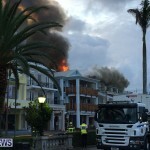 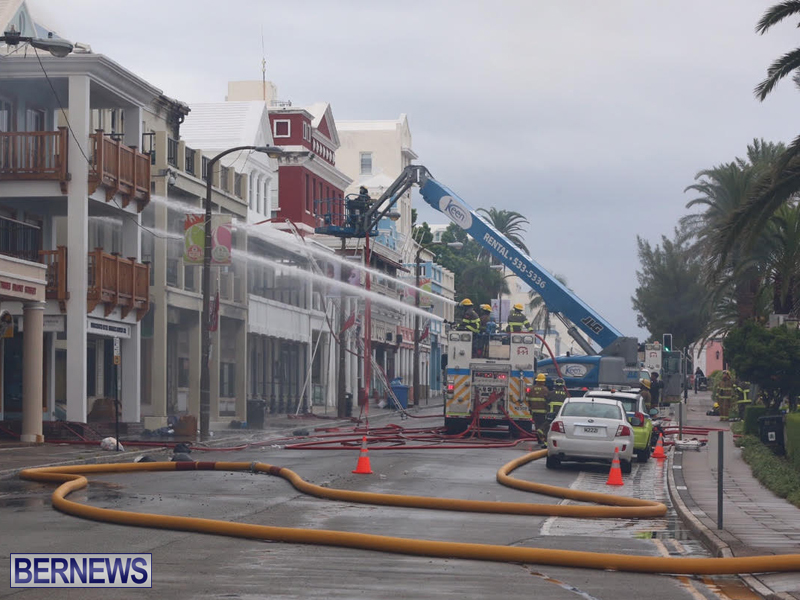 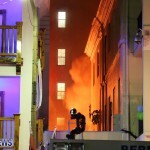 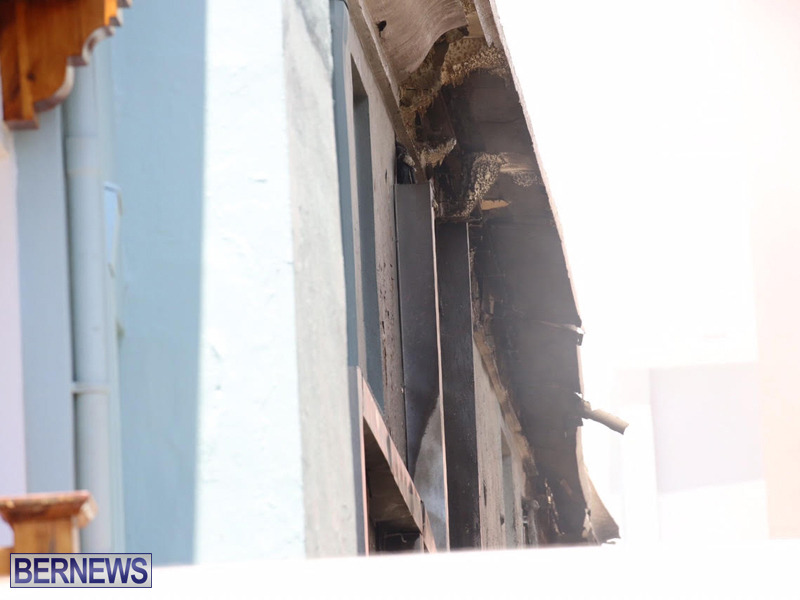 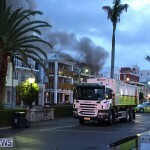 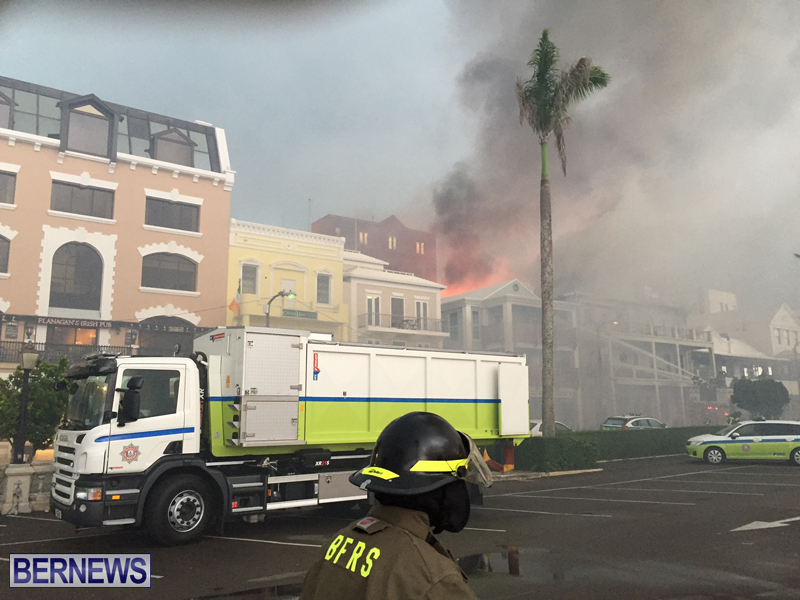 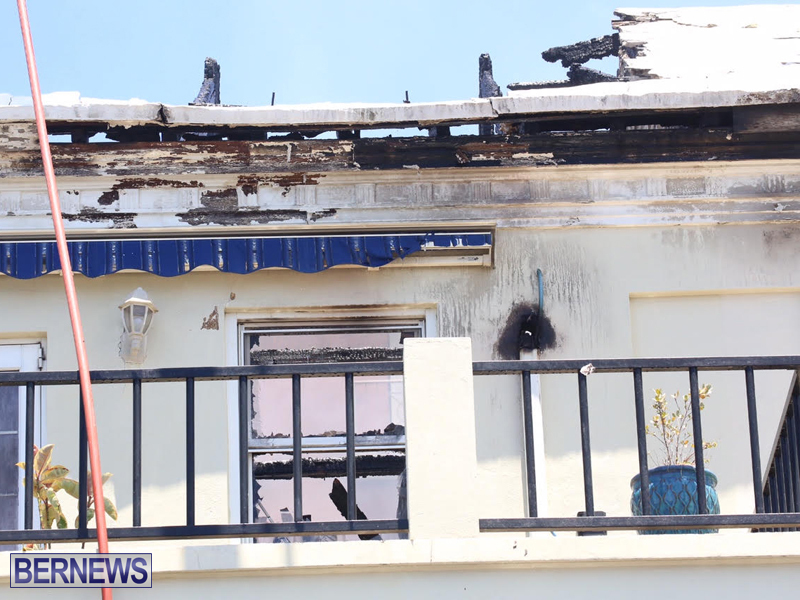 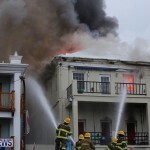 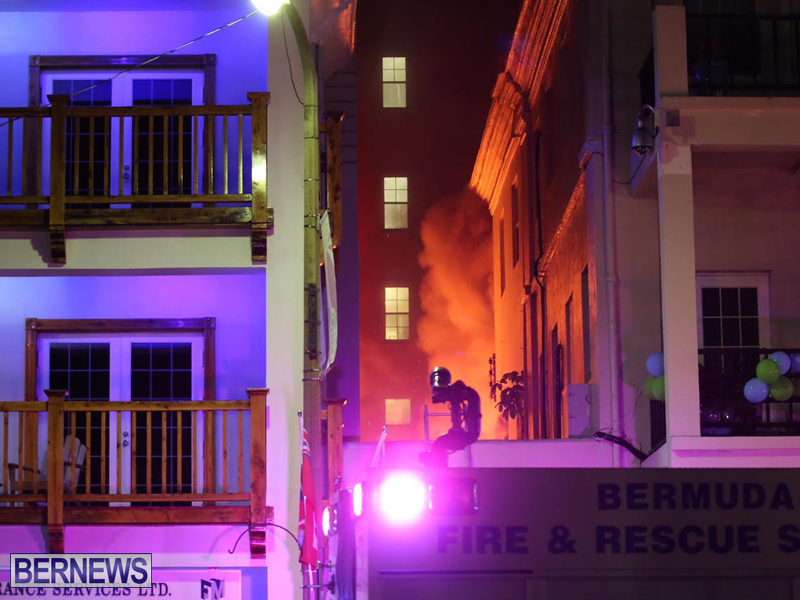 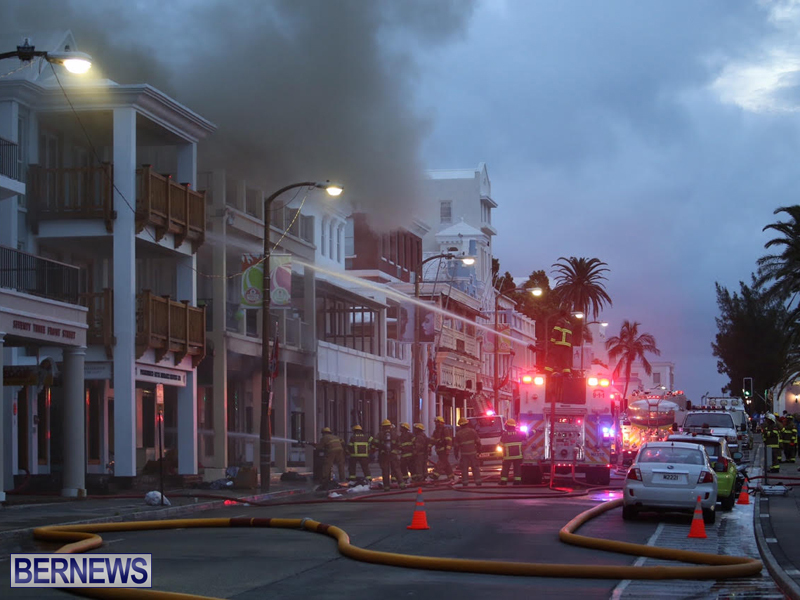 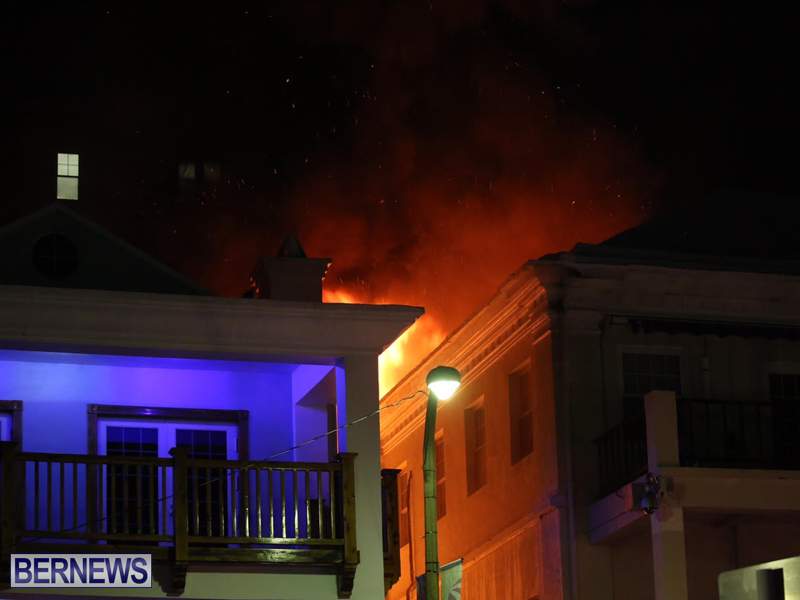 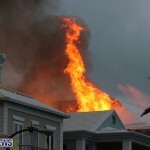 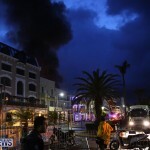 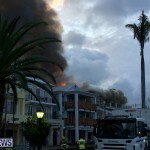 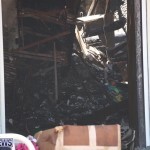 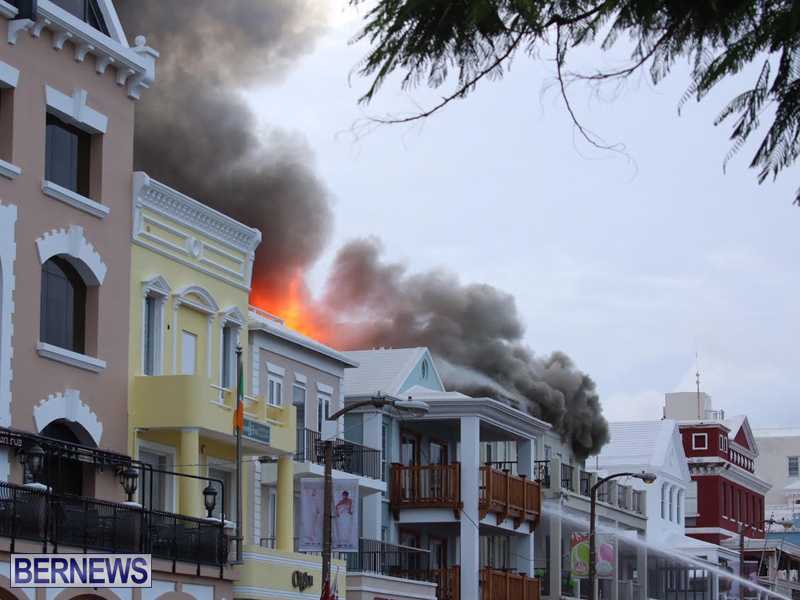 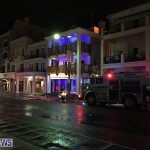 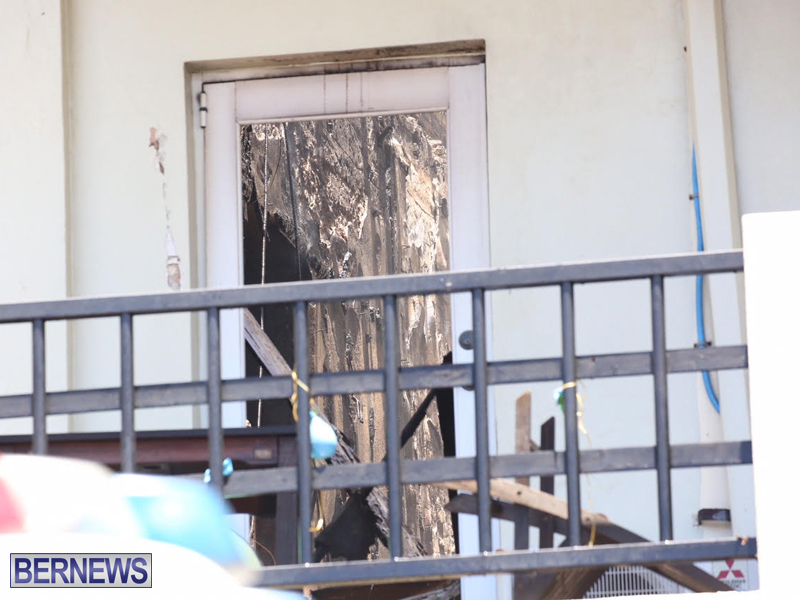 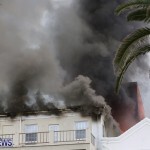 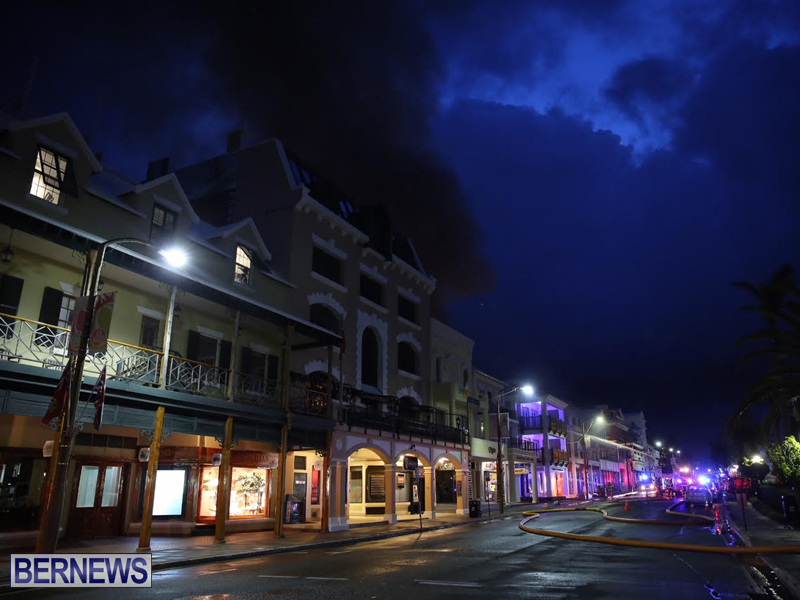 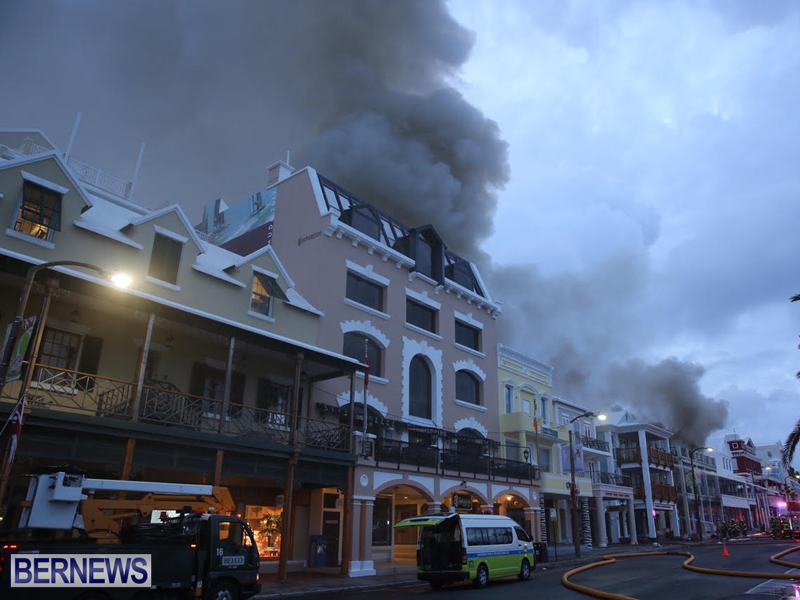 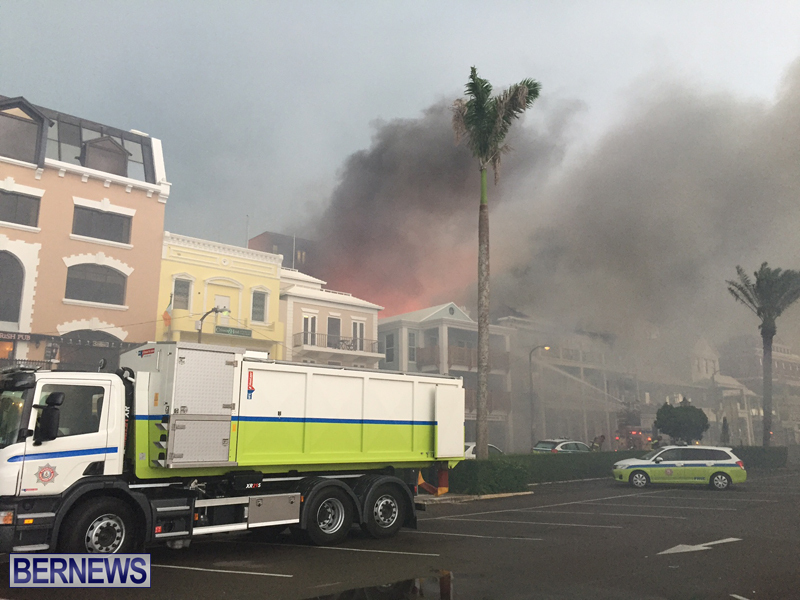 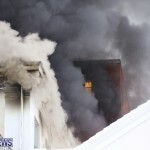 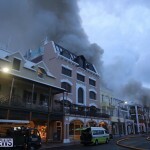 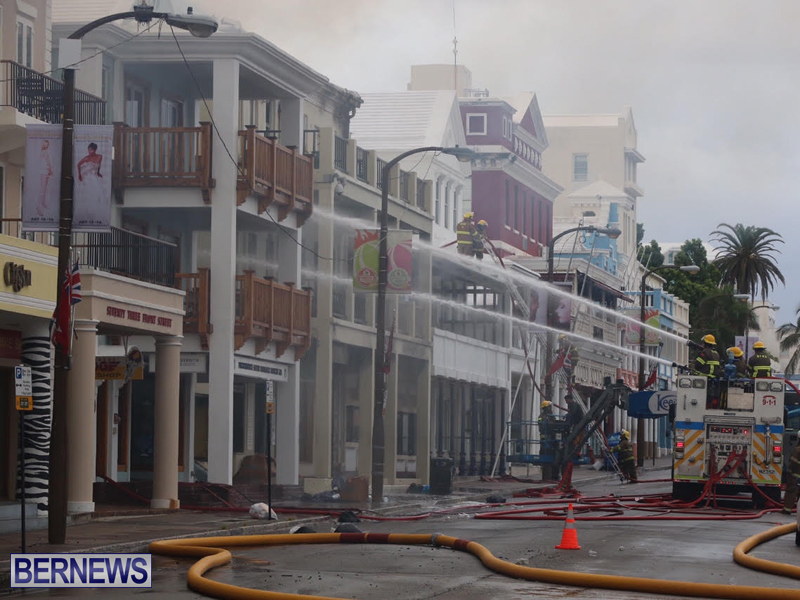 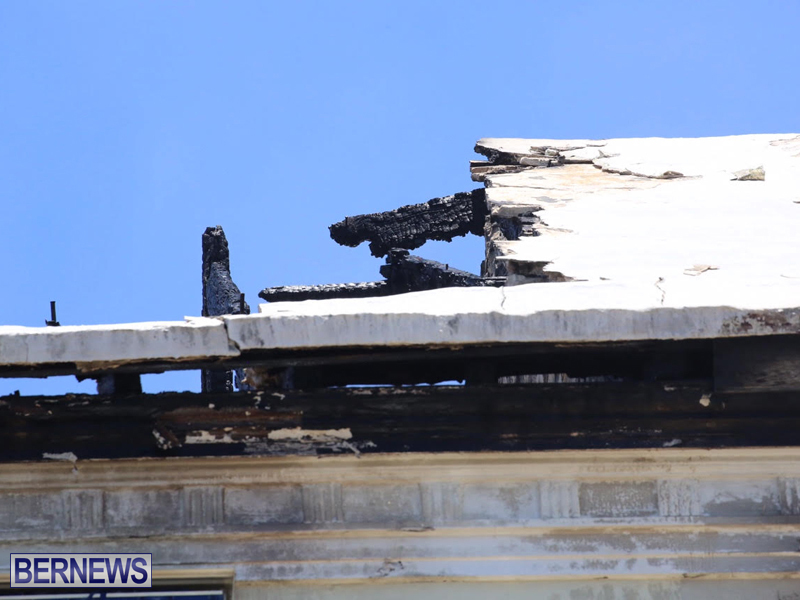 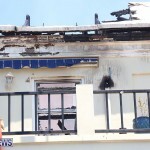 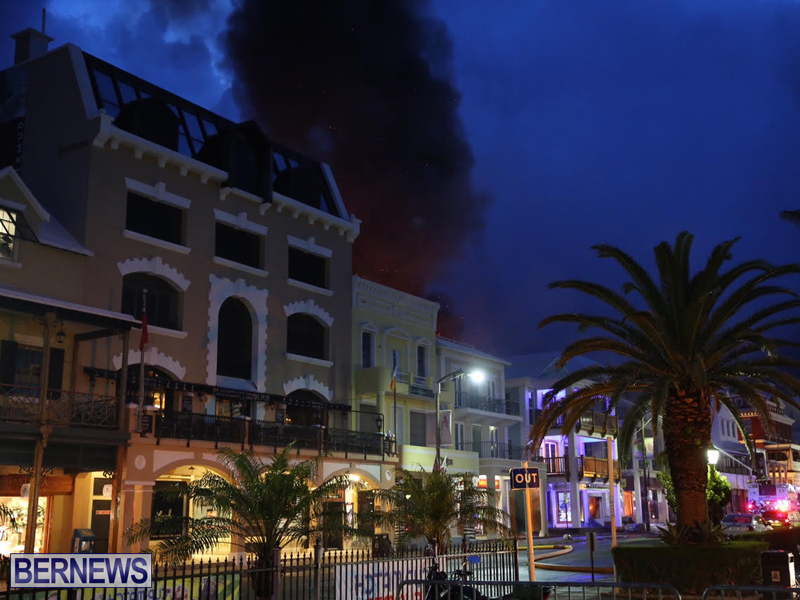 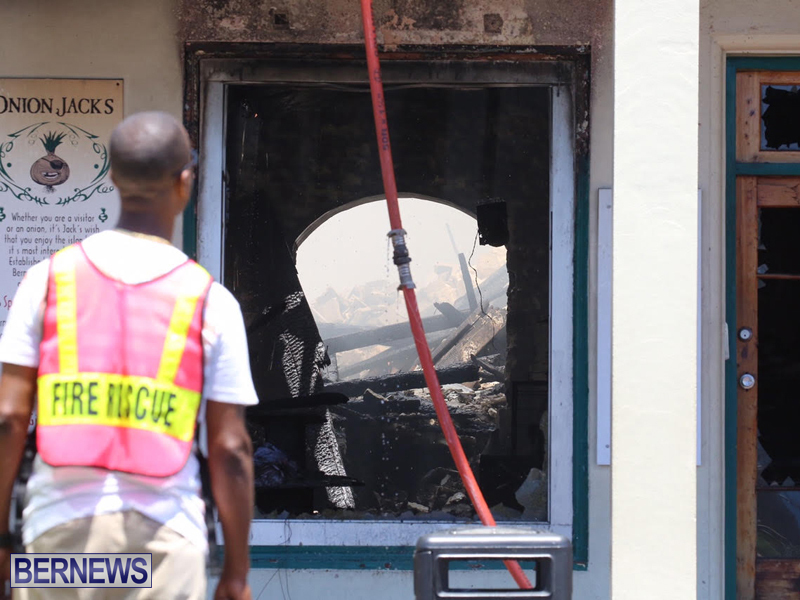 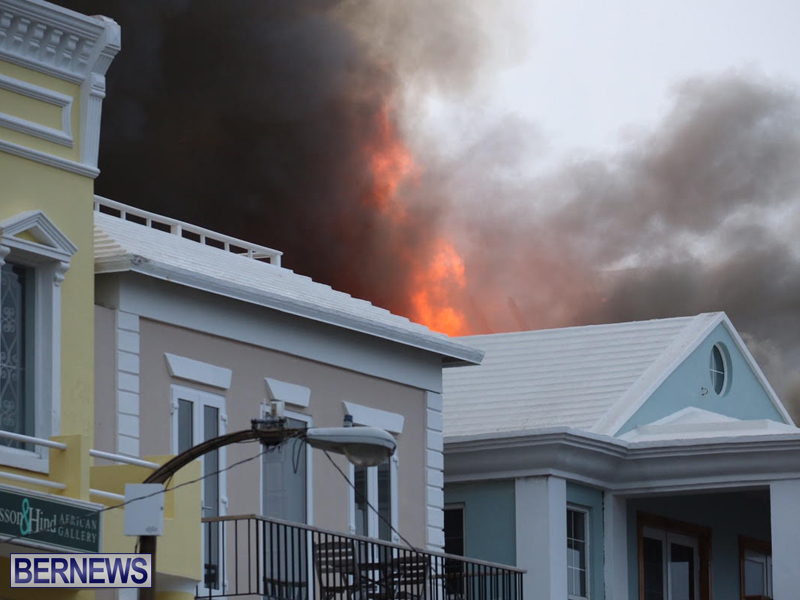 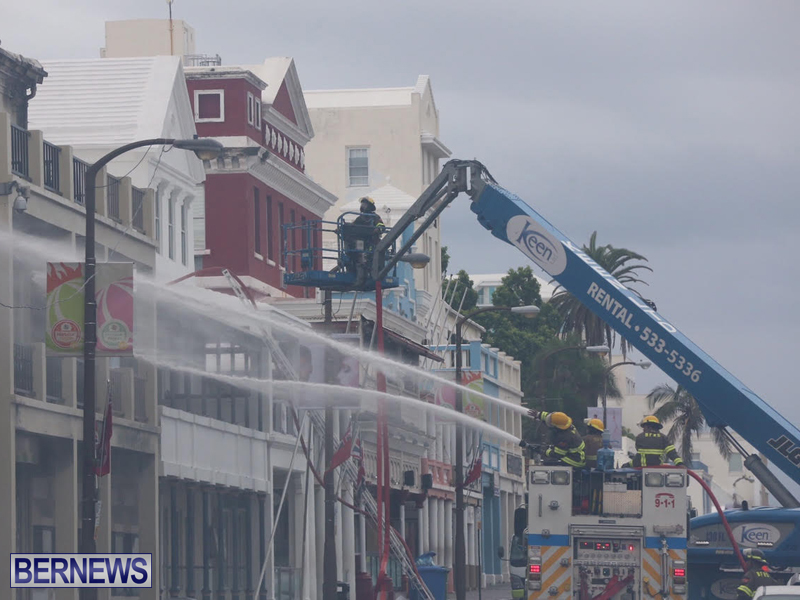 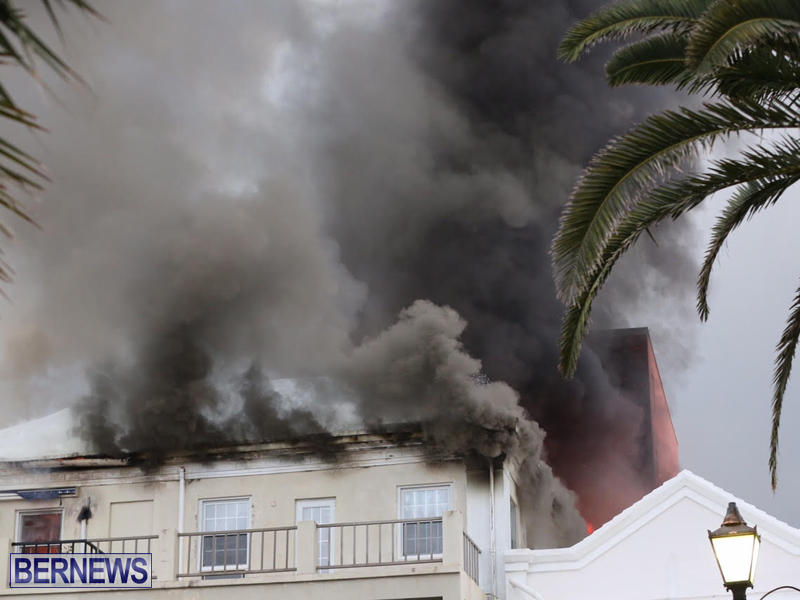 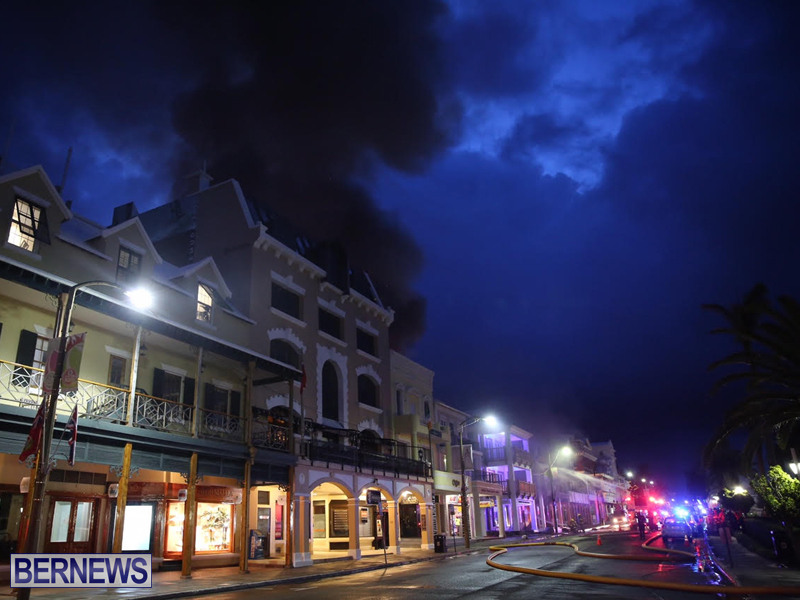 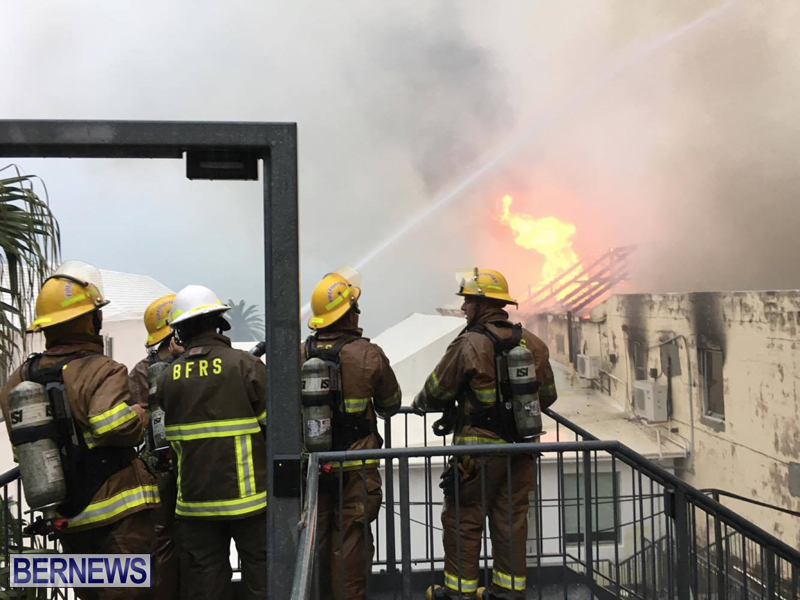 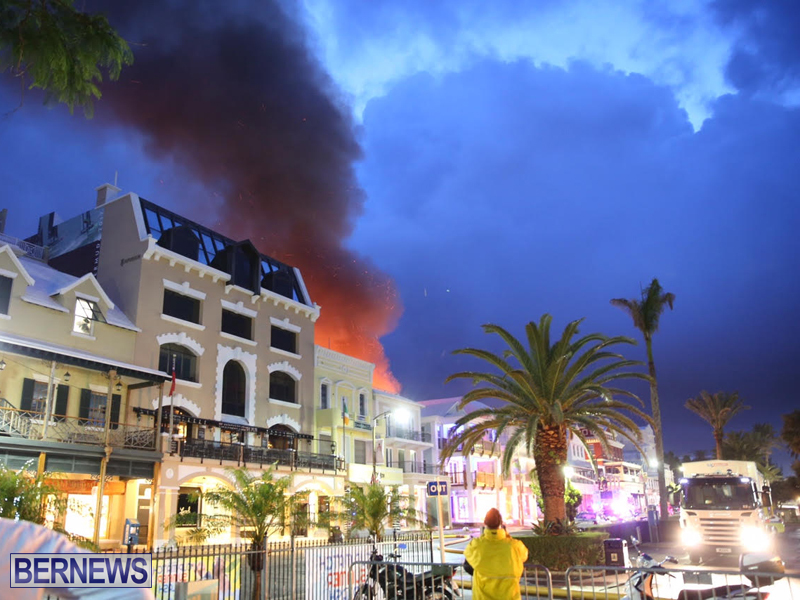 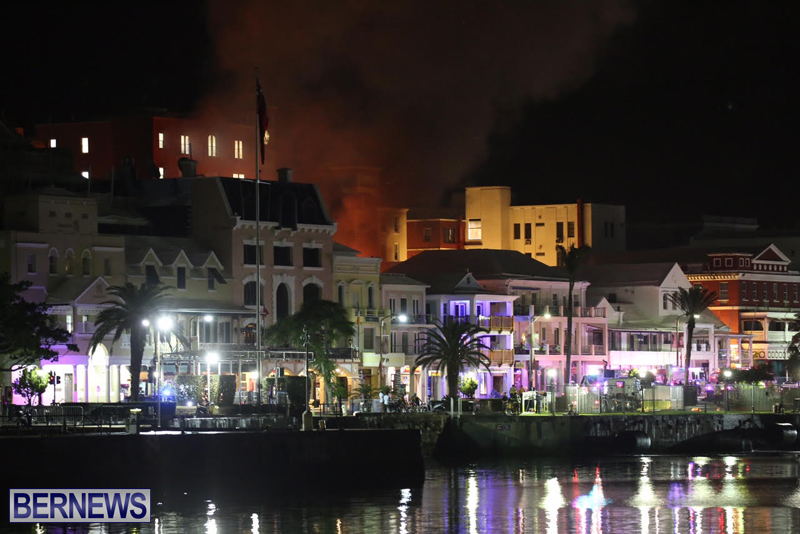 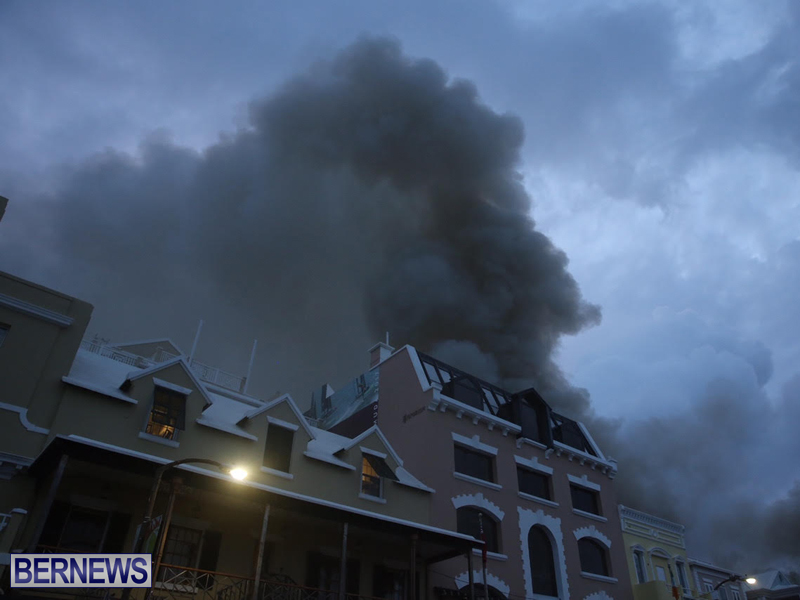 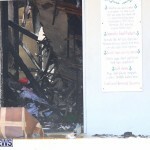 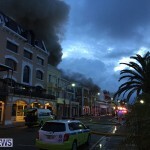 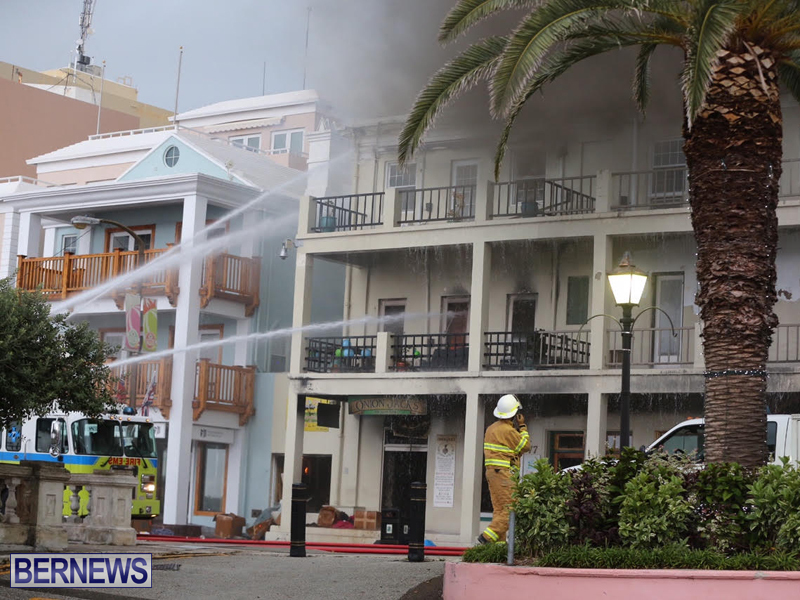 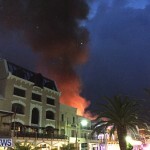 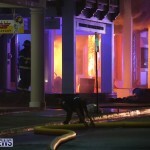 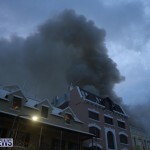 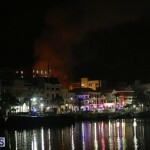 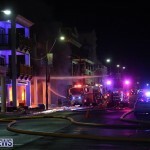 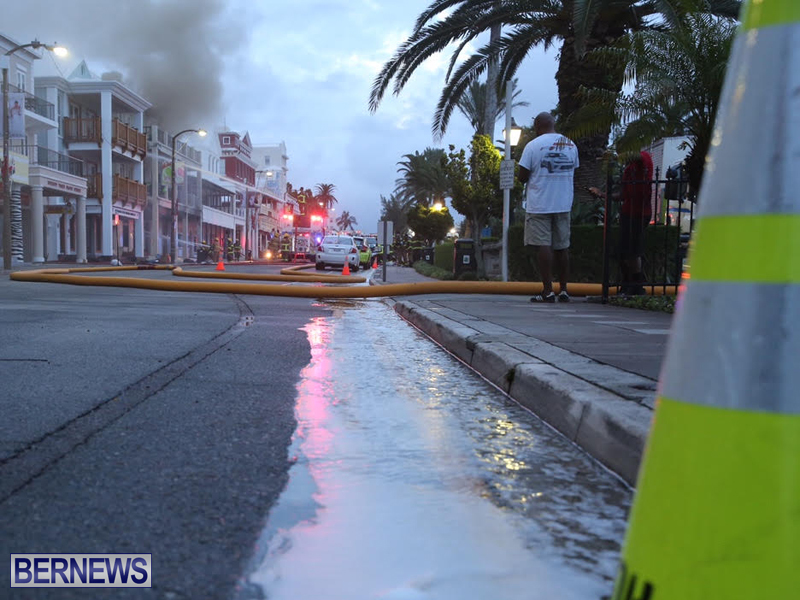 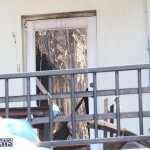 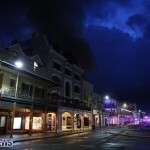 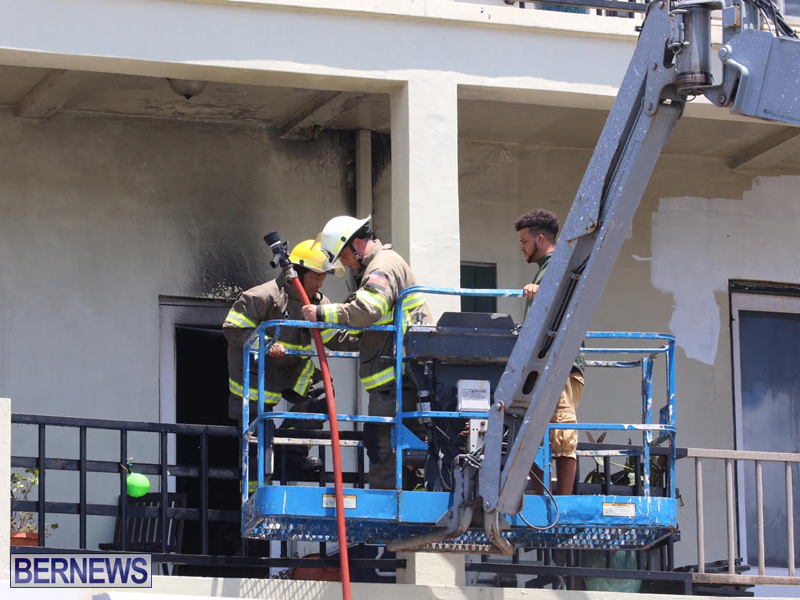 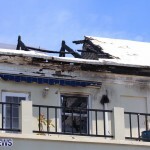 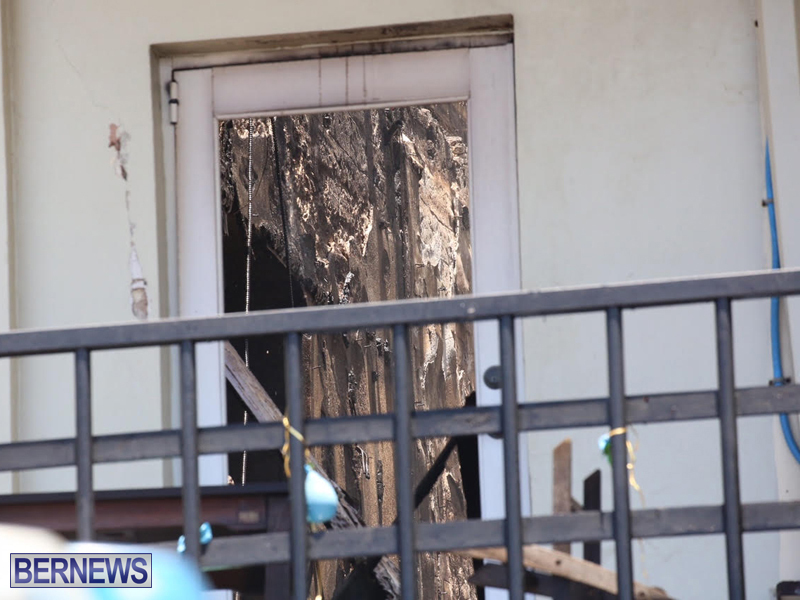 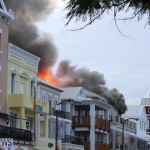 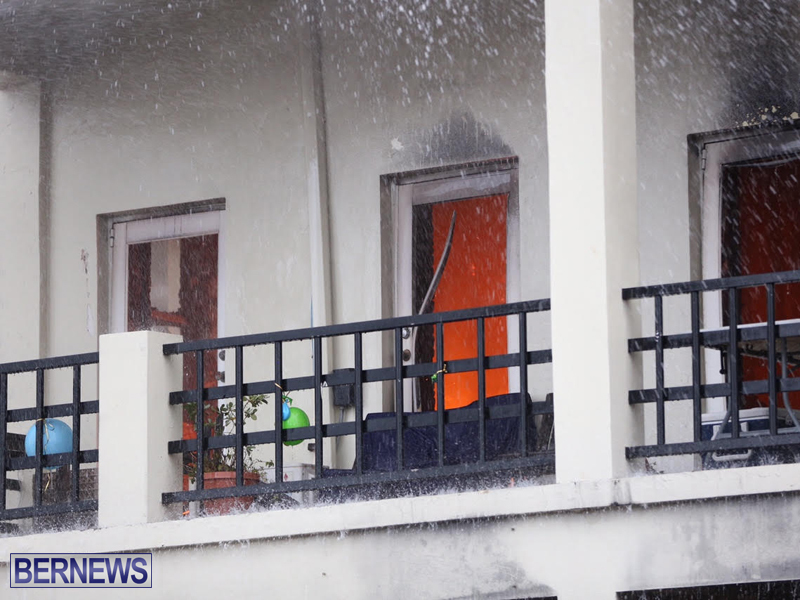 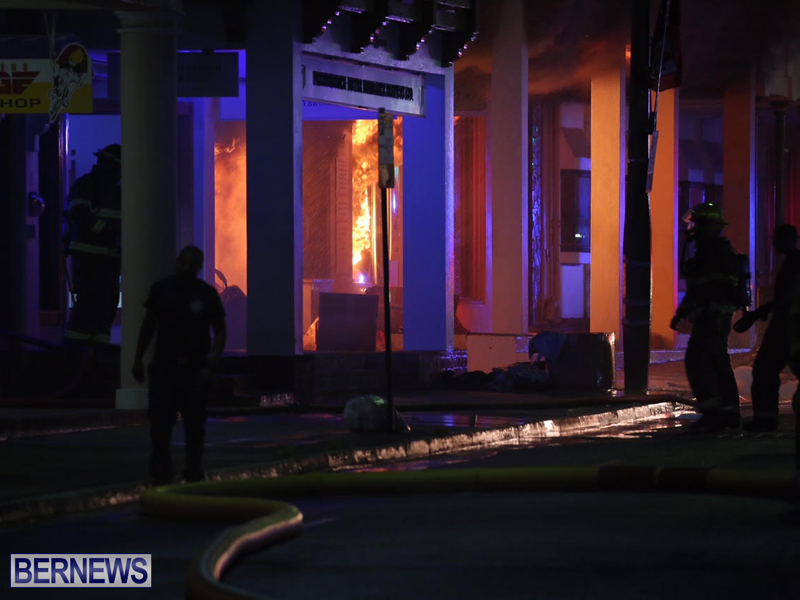 At approximately 4.32am this morning [July 21], the Bermuda Fire and Rescue Service responded to a fire on Front Street in Hamilton, with some 16 vehicles and over 30 personnel attending the scene. 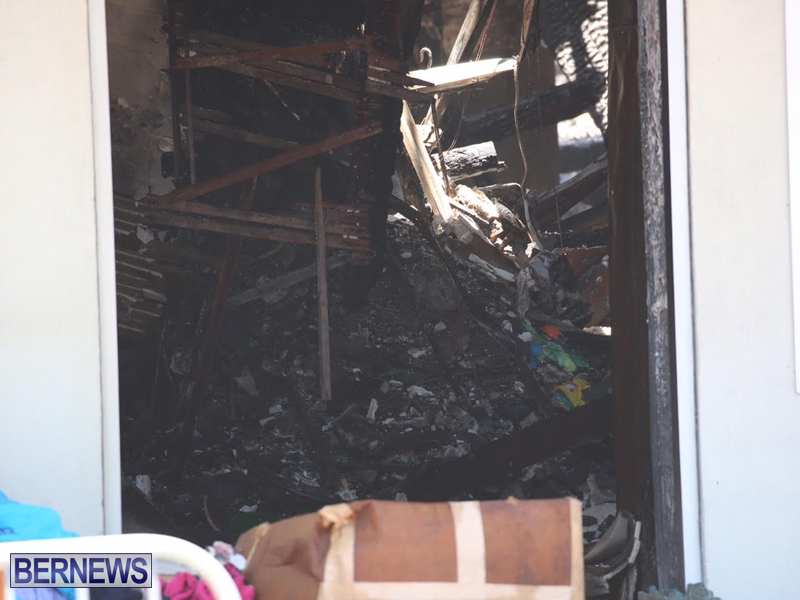 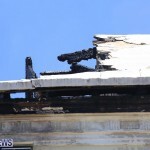 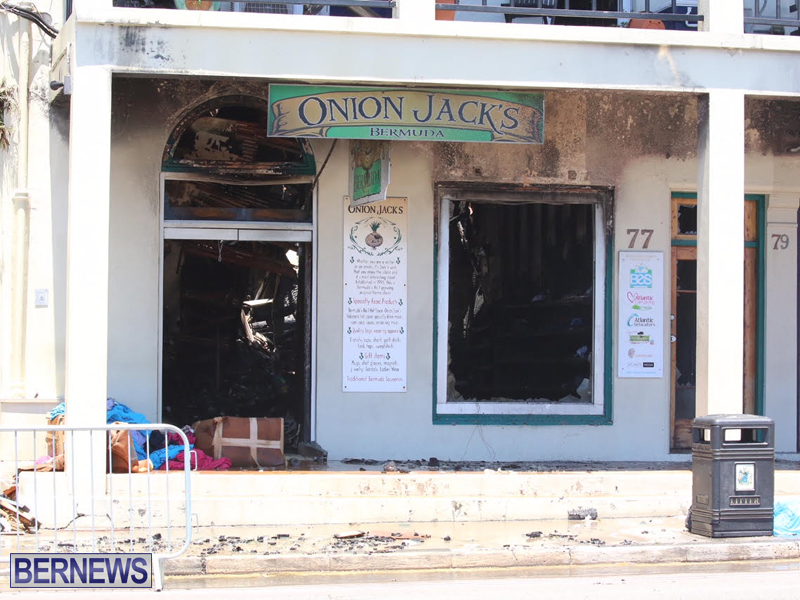 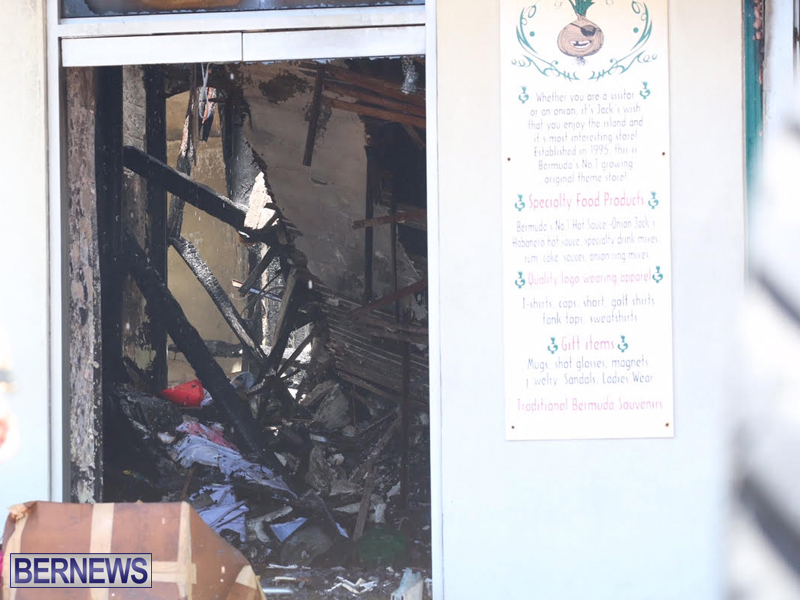 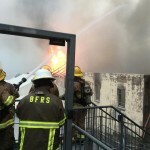 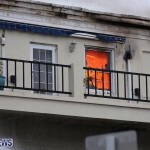 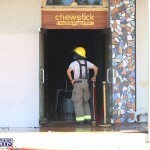 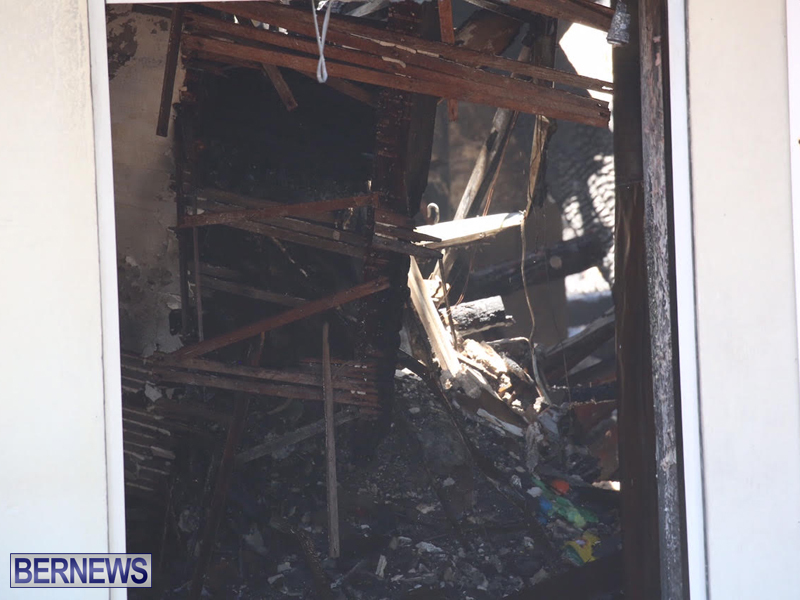 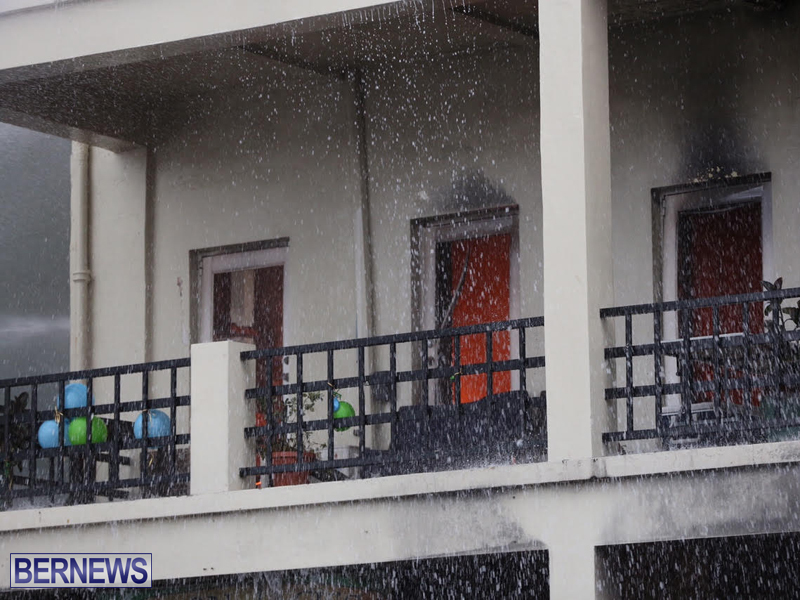 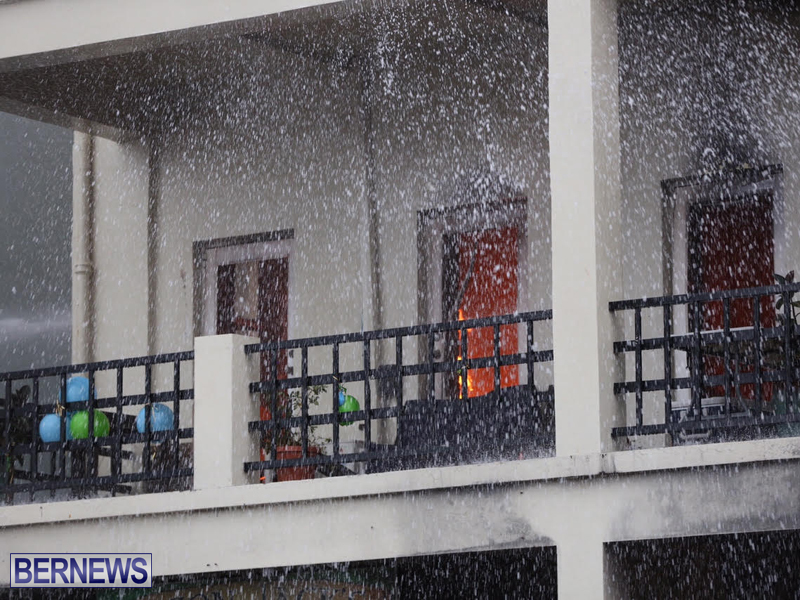 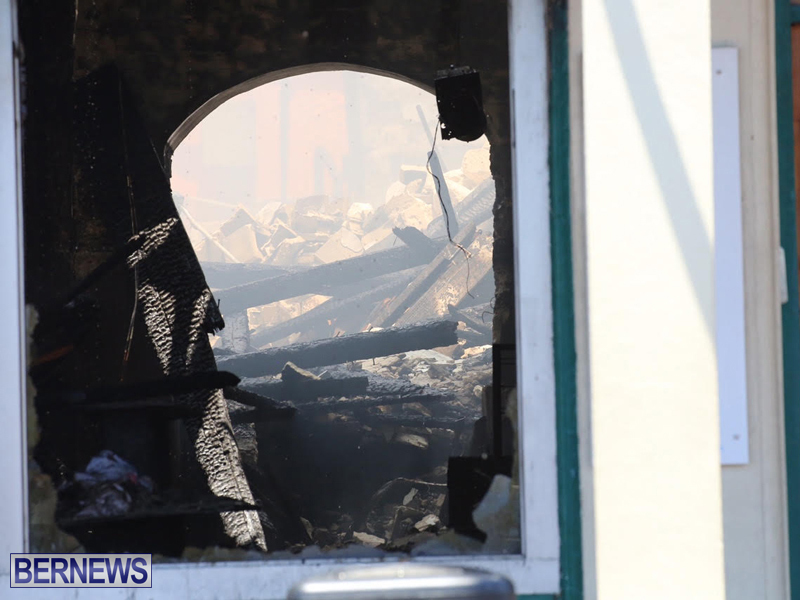 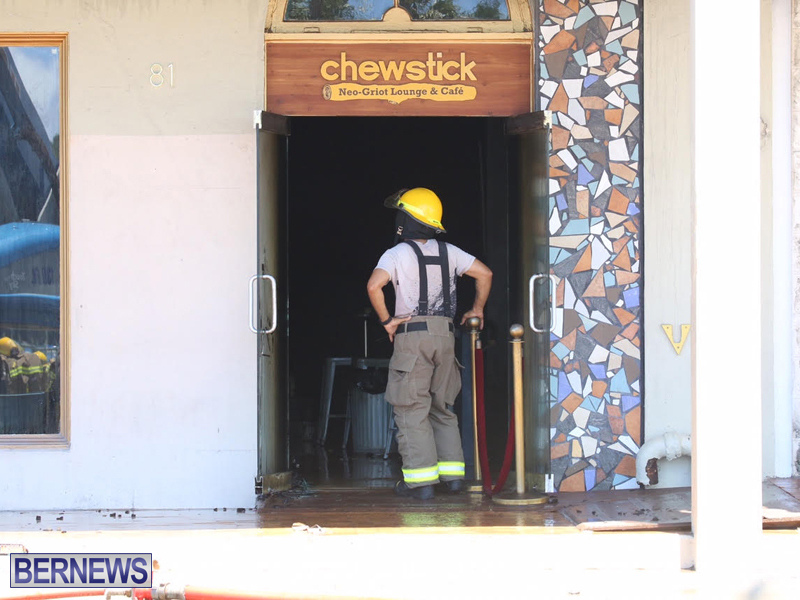 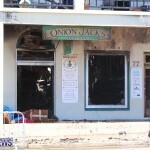 The BFRS later confirmed that while there were “no reported injuries at this time to civilians or firefighters” the buildings involved — which house Chewstick and Onion Jack — “sustained major damage”. 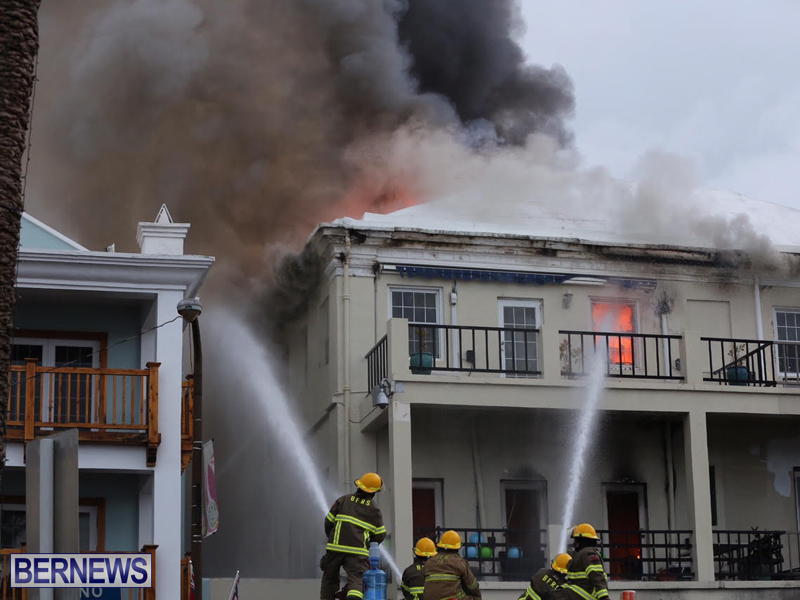 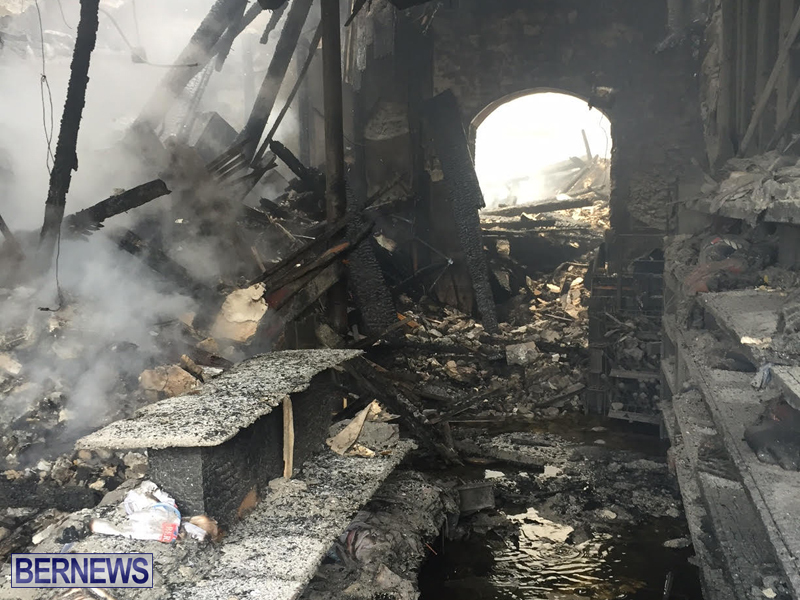 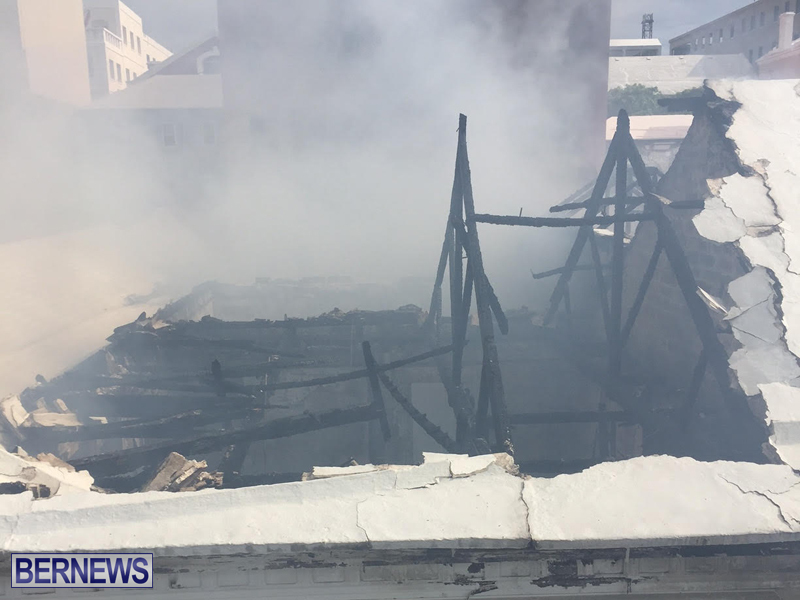 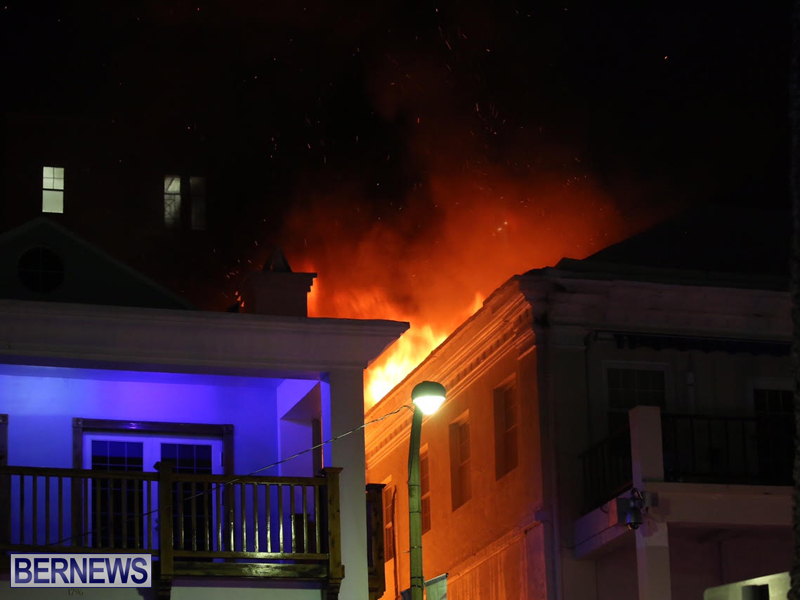 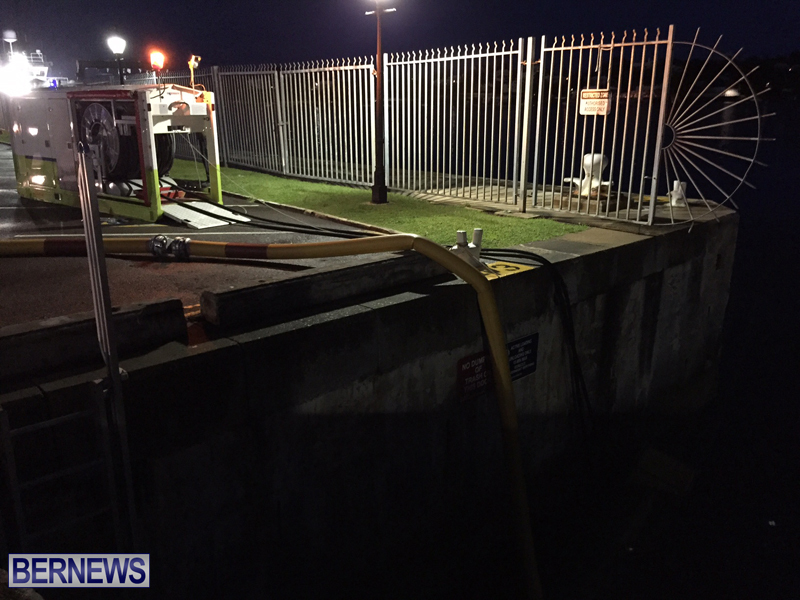 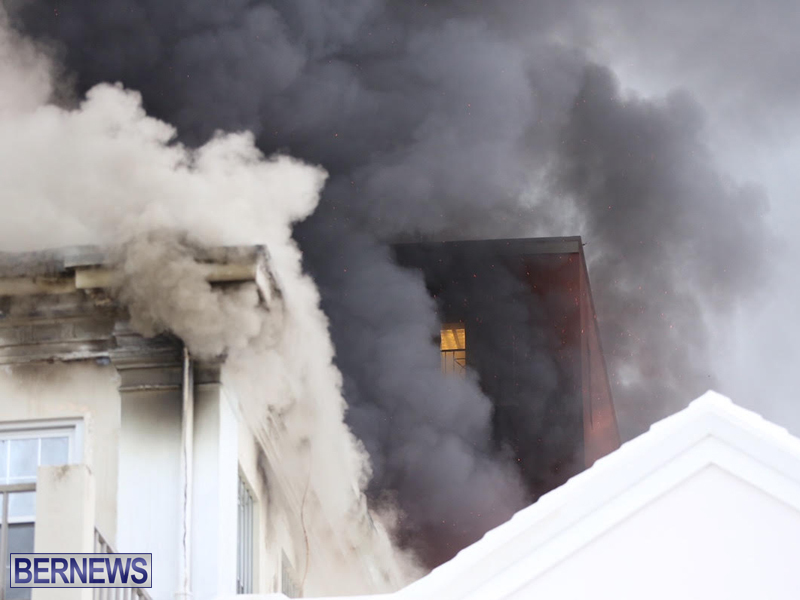 Sergeant Delton White said, “We responded to a three story fire on Front Street where there were visible flames and smoke seen emitting from the building. 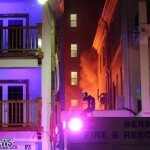 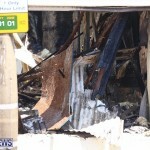 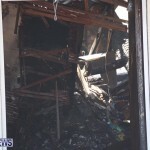 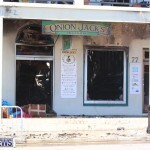 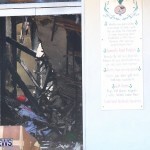 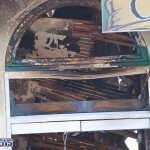 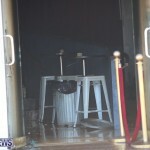 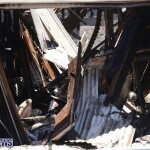 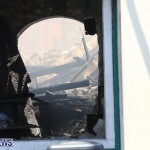 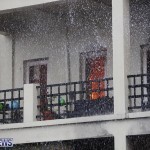 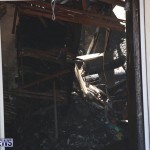 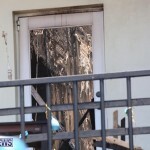 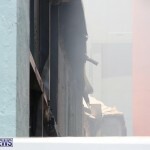 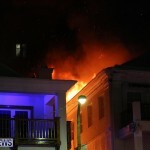 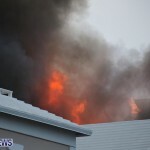 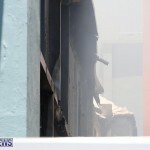 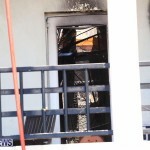 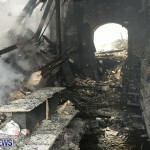 On our arrival, we discovered flames in an alleyway between the buildings. 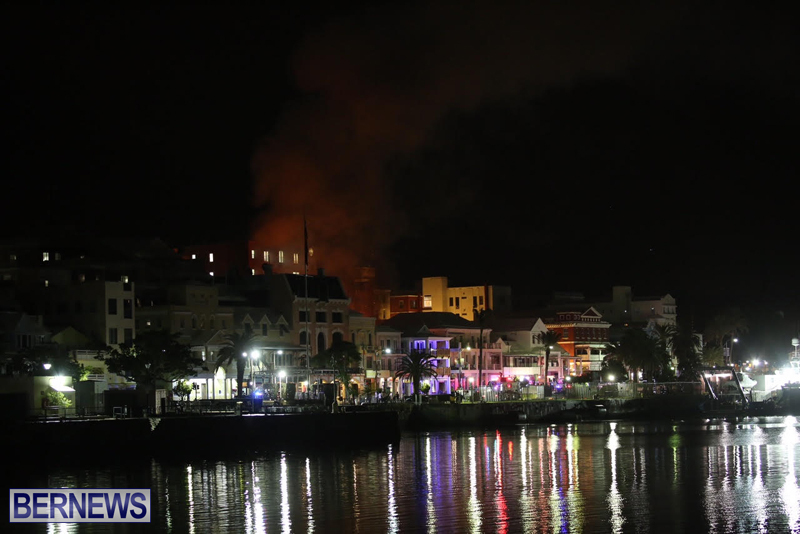 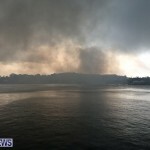 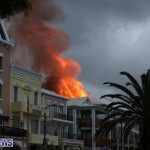 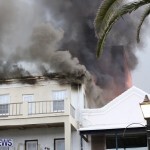 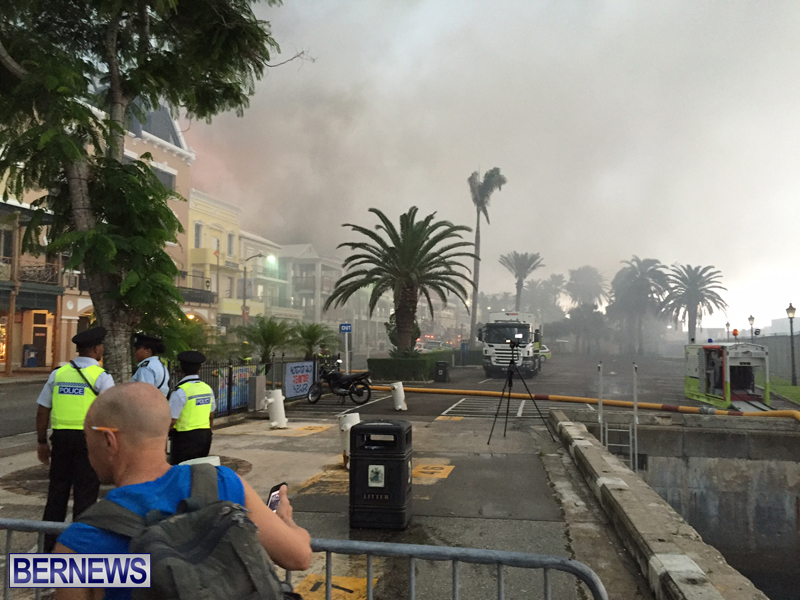 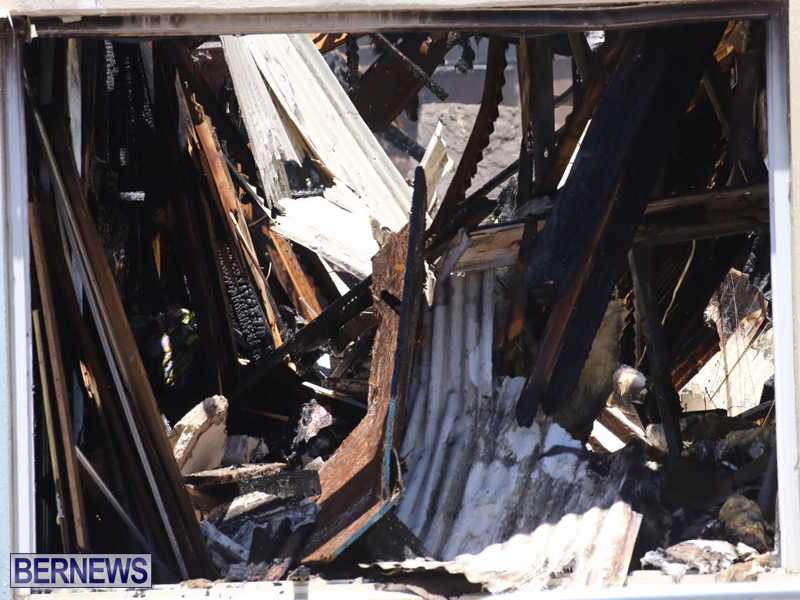 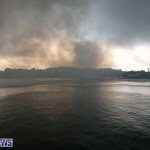 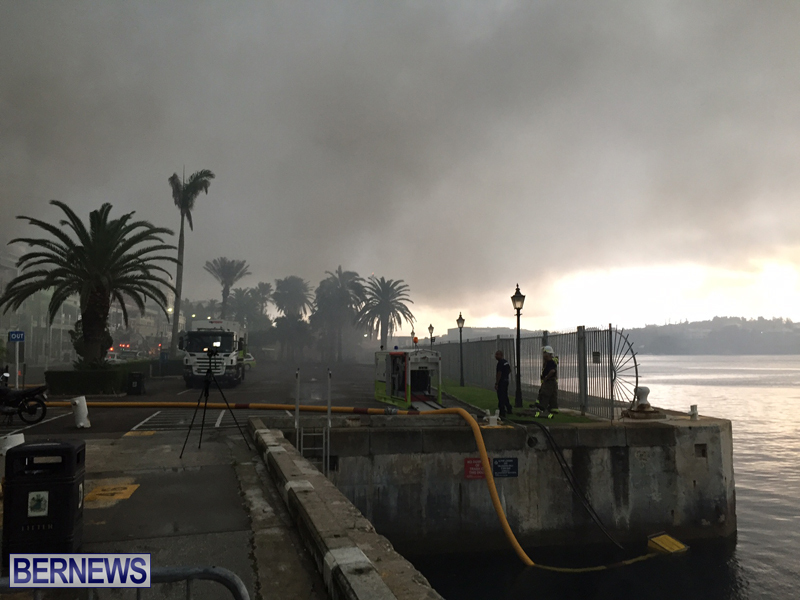 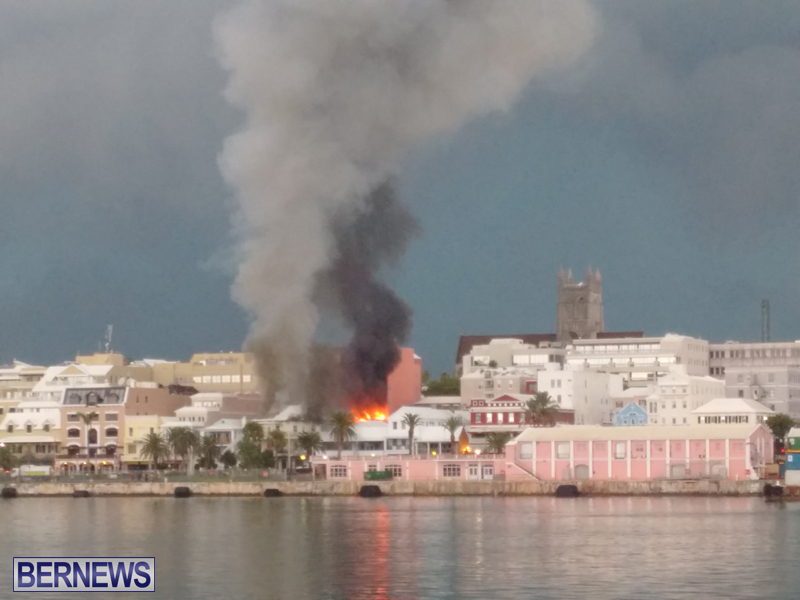 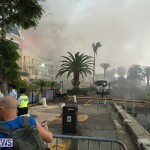 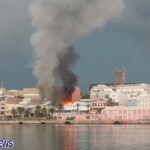 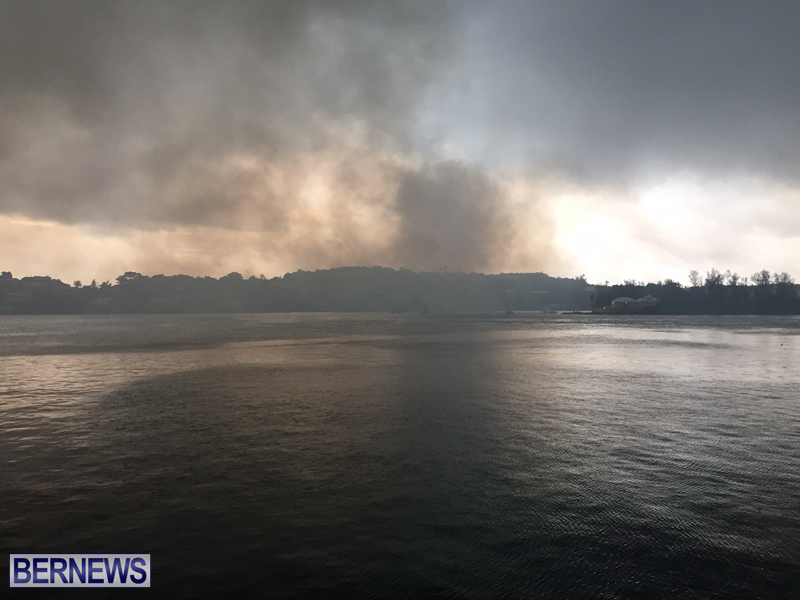 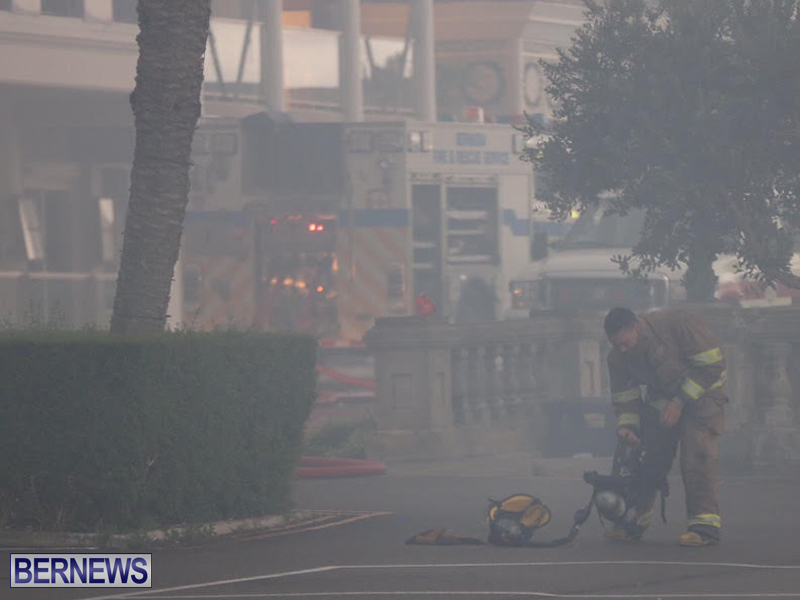 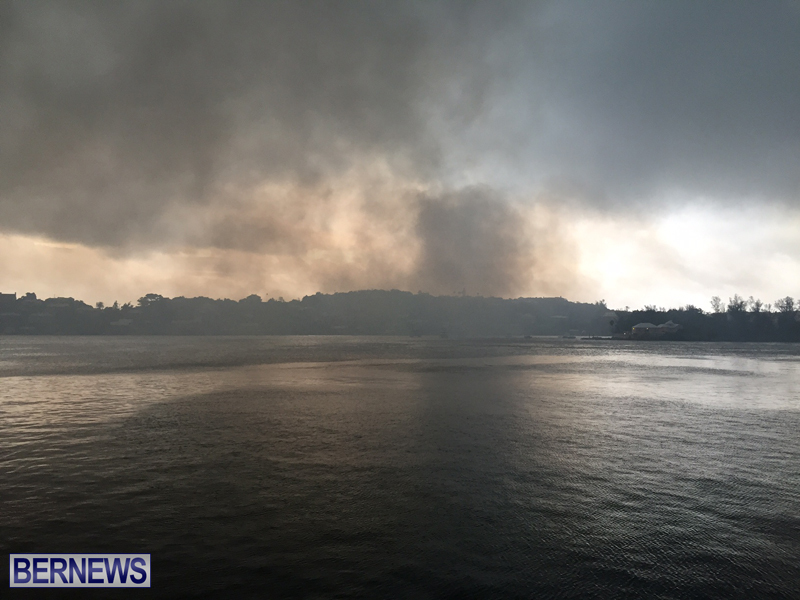 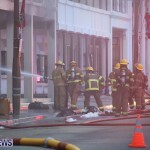 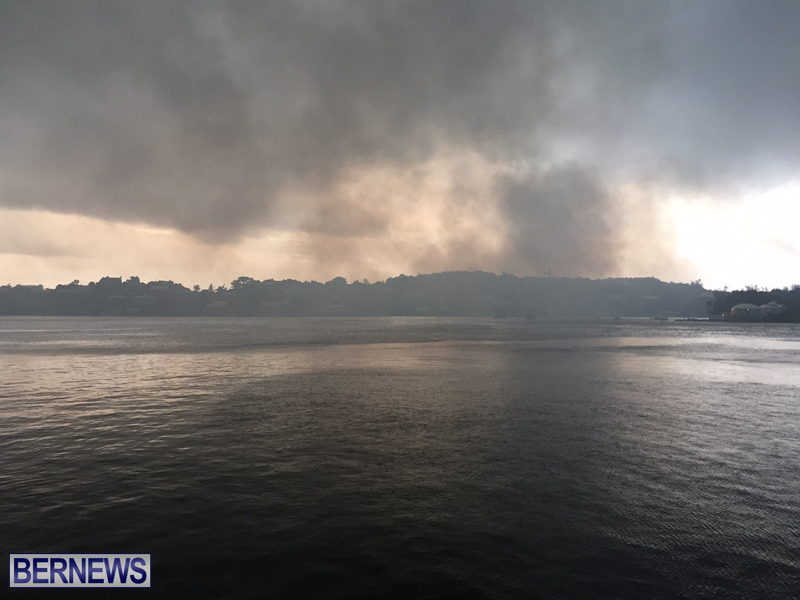 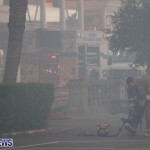 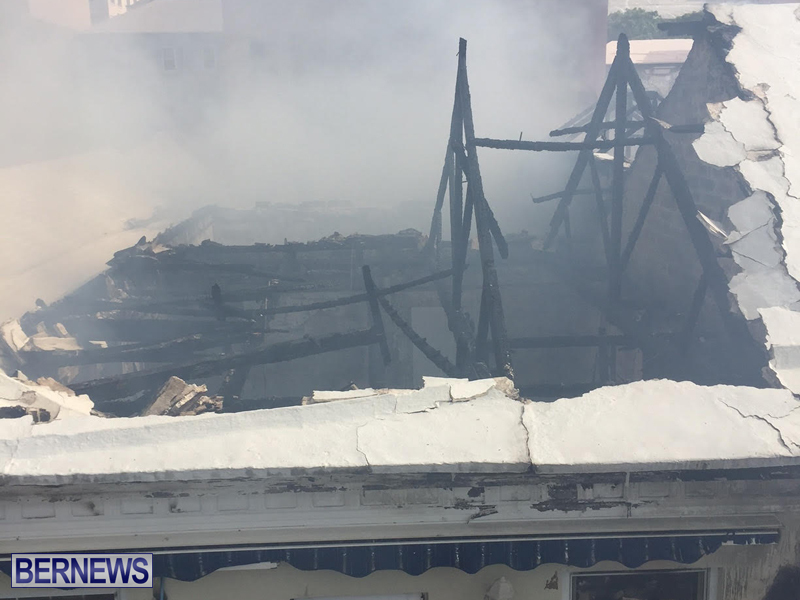 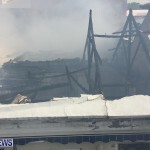 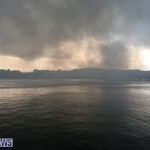 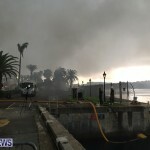 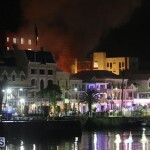 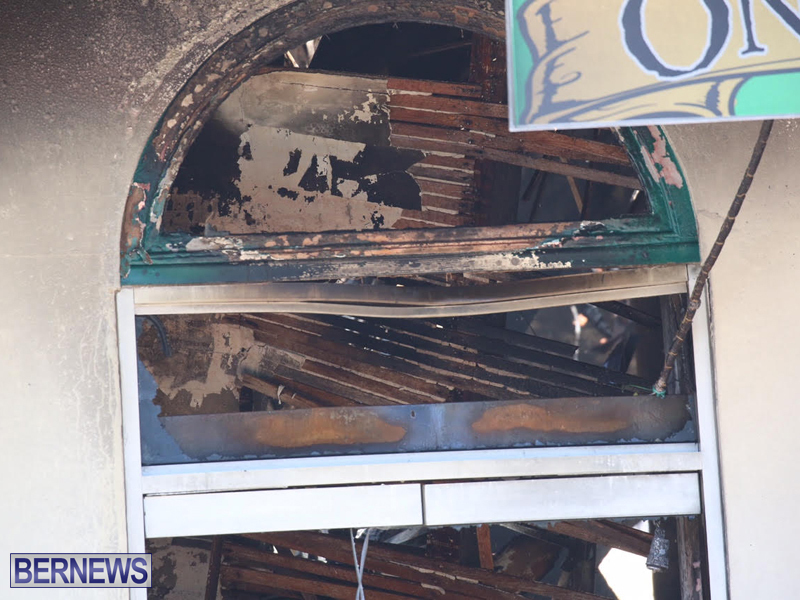 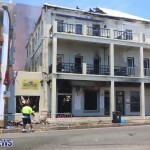 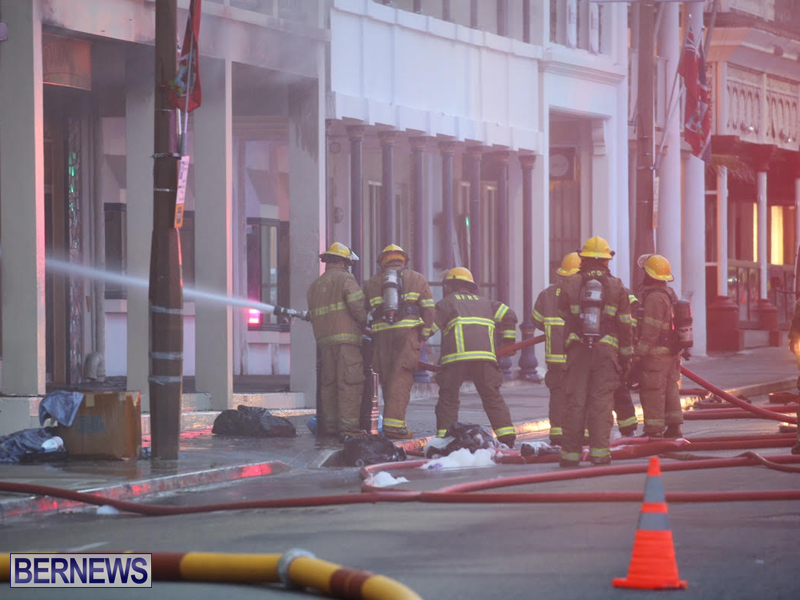 Large plumes of smoke could be seen over Front Street as firefighters battled the blaze, with their efforts including using water from the Harbour. 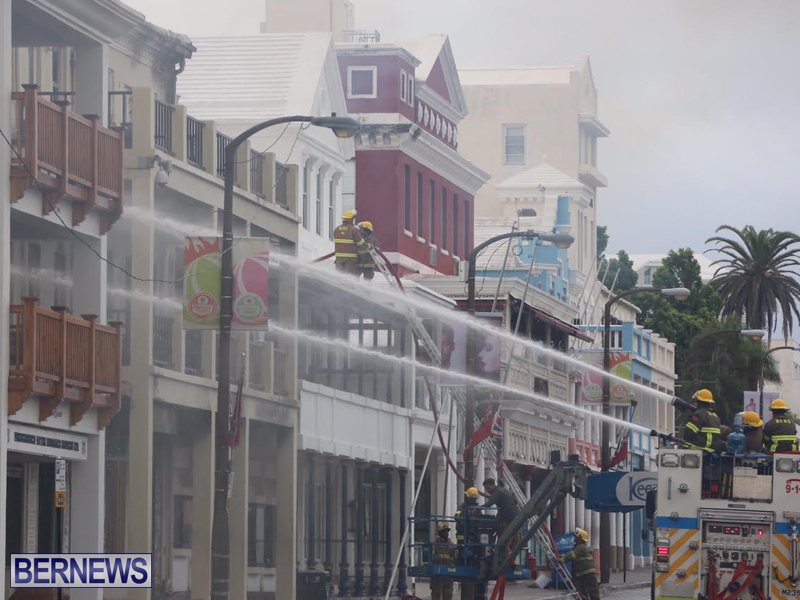 Police advised the public of major traffic delays, saying that traffic diversions have been put in place and recommending that commuters heading into the City of Hamilton use alternate routes where possible. 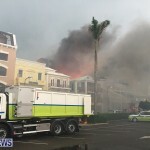 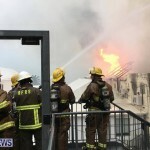 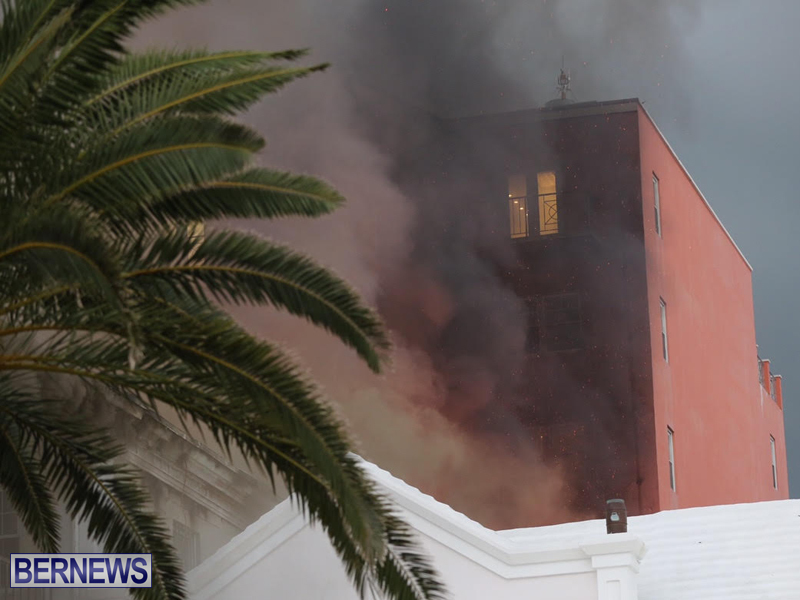 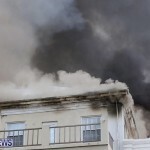 William Madeiros of Freisenbruch Meyer said the fire is in the building immediately adjacent to theirs, and confirmed that their team is safe, as is their clients’ data. 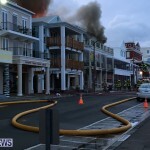 You can follow updates on the fire by clicking here. 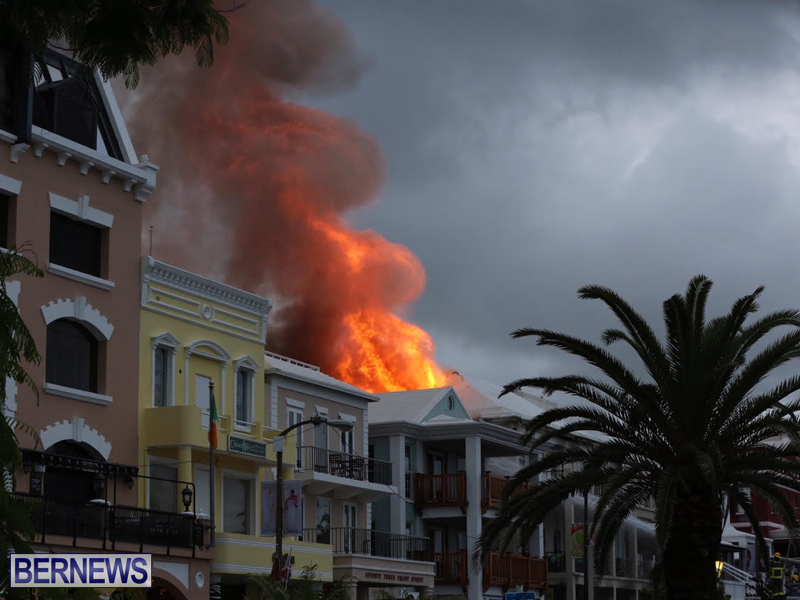 Someone’s fire Pokemon got loose…. 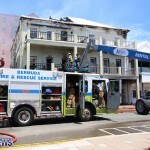 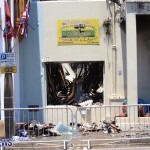 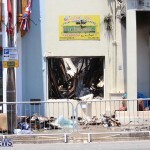 Excellent work Bermud Fire Service. 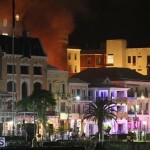 We are really proud of you!